As a special treat, I like to have something sweet after a weekend dinner. I was recently asking John for requests, and I just about died when he suggested blondies. 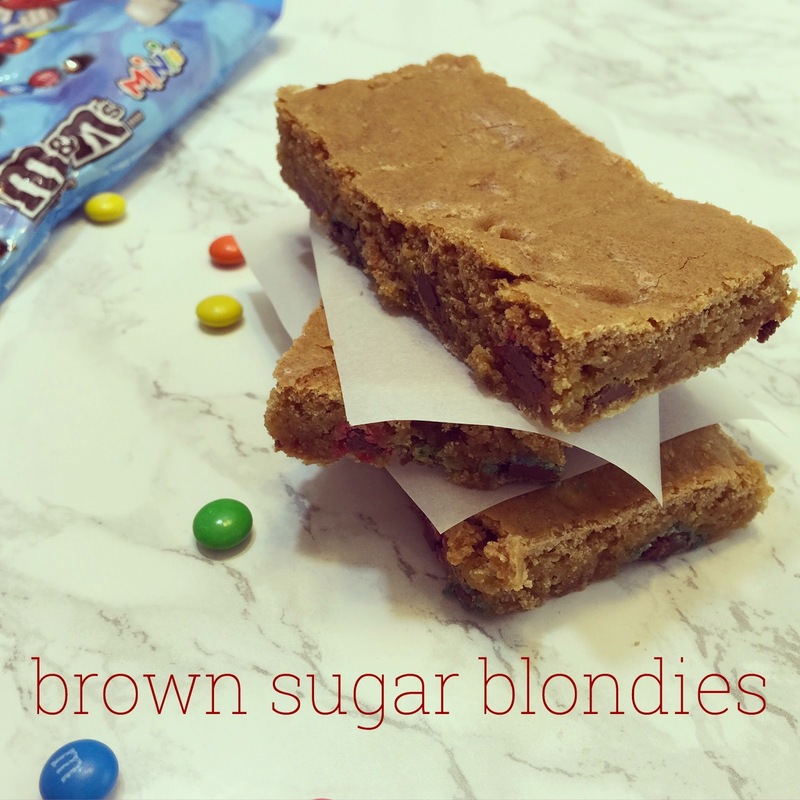 I love a brownie, but I love a blondie! 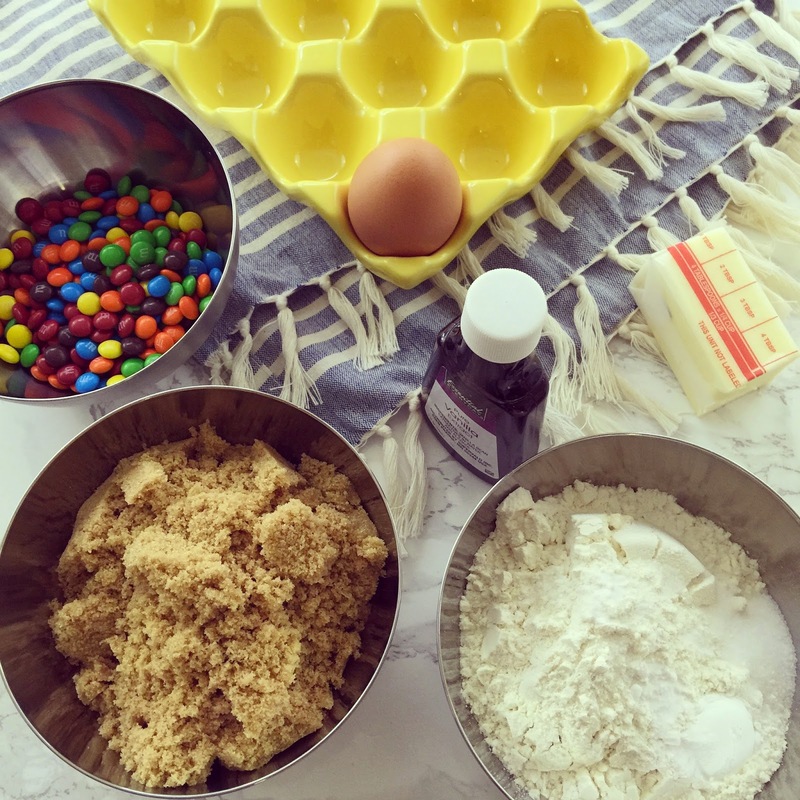 And these brown sugar M&M blondies were uh-mazing! 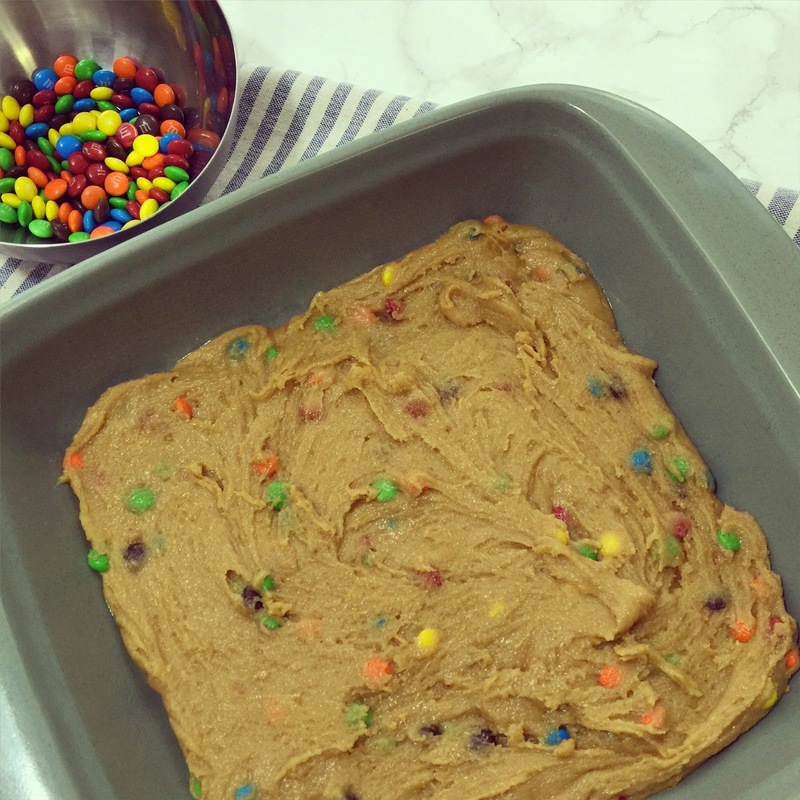 Enough to go big, but not too much that you're stuck with blondies for a week! 1. Melt the butter and mix with the brown sugar. 2. Beat in the egg and vanilla extract. 3. 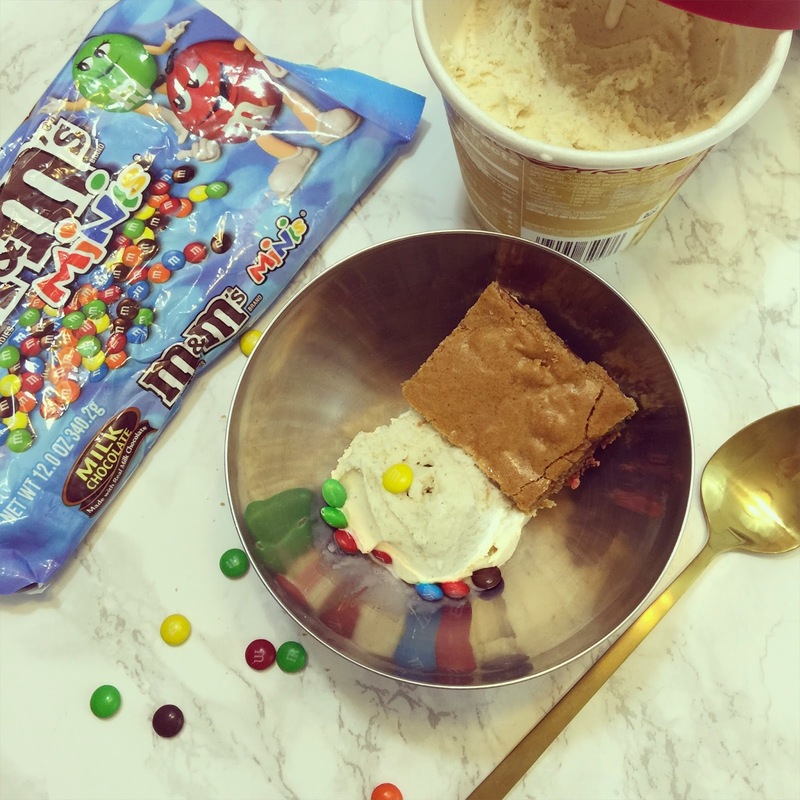 Slowly mix in the remaining dry ingredients and fold in the M&Ms. 4. 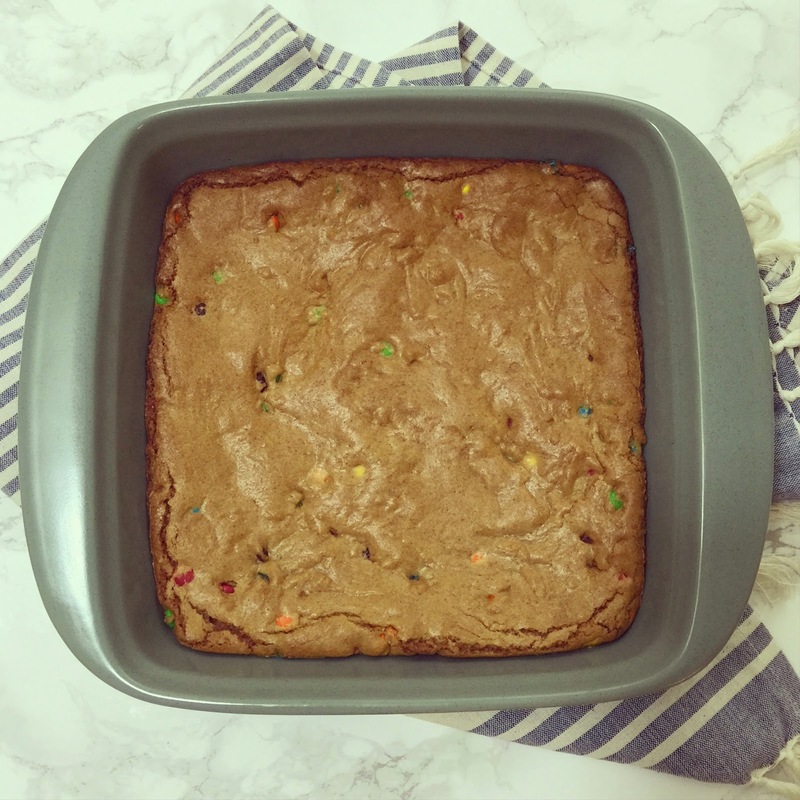 Pour batter into a greased 9x9 pan and bake at 350 degrees for 25 minutes. 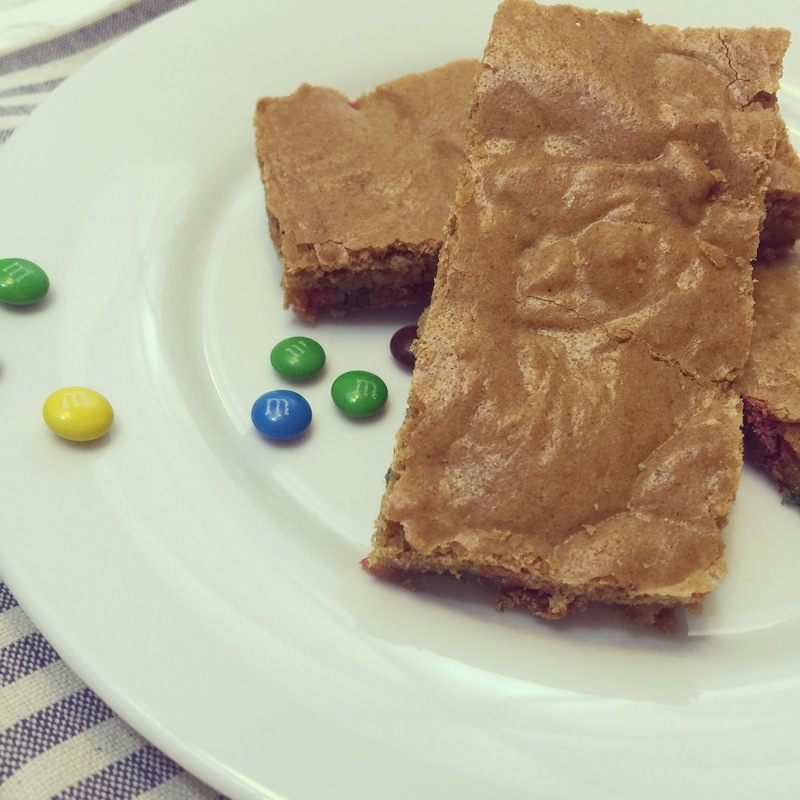 Once the blondies are done baking, dig in as fast as possible - they honestly melt in your mouth when served warm! Or, if you can't get to them while they are fresh out of the oven, just pop a square the microwave for 20 seconds. Serve with a bit of ice cream, and watch out - you will likely eat the whole pan!! Confession: Up until this past Friday, I have had my pine cone (aka, winter) wreath hanging on my front door. This may not seem unusual if you live in one of the cities that had a snow fall this past week (what?! ), but here in Arizona we've been pushing the 80s for a long while now. 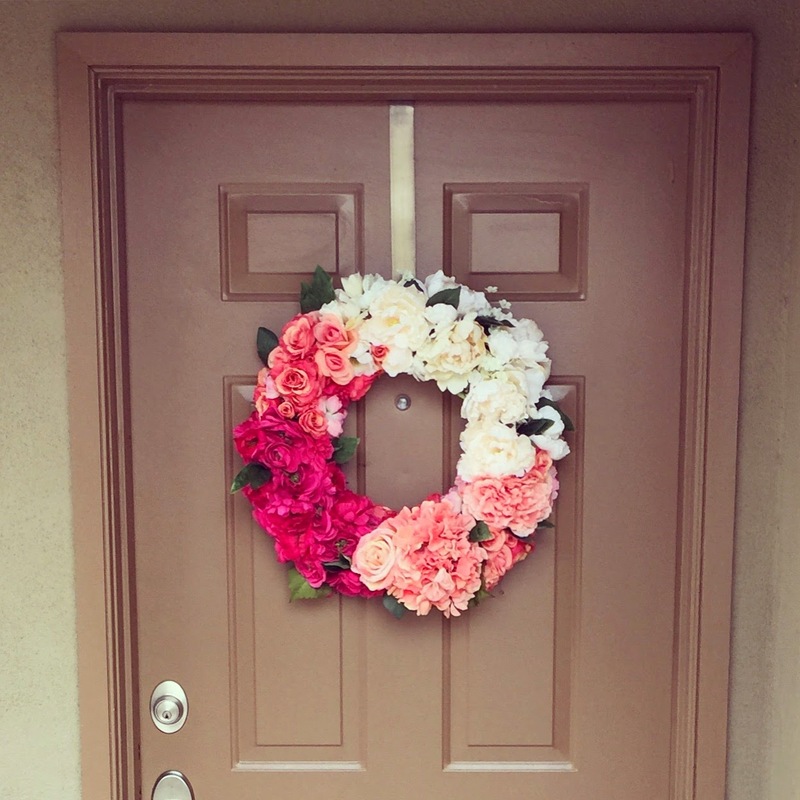 And I wanted a wreath that would transition well from spring into summer... so the most obvious option was a little DIY action! 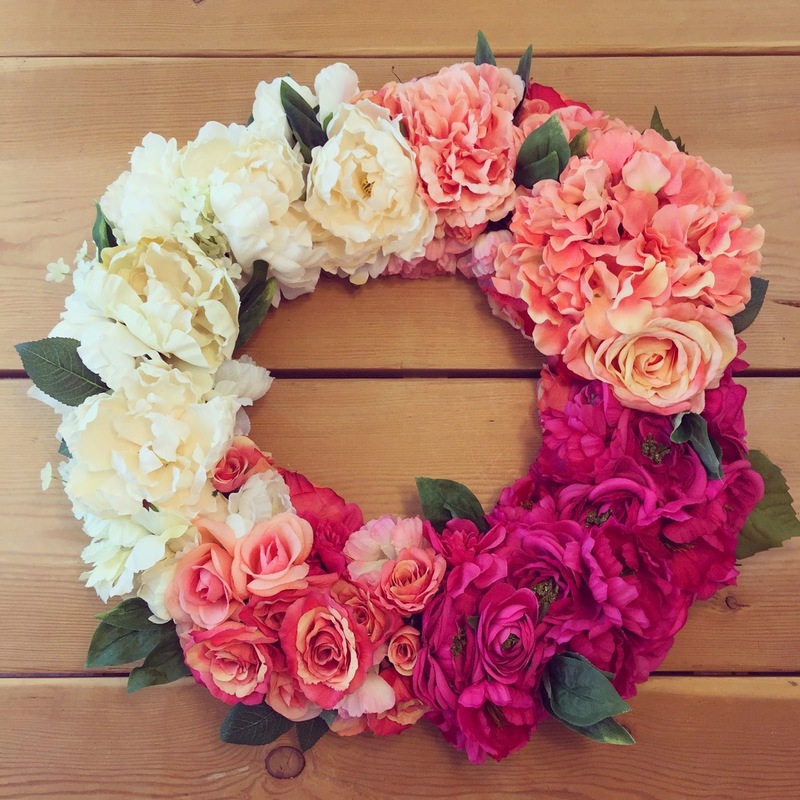 This DIY ombre wreath is so easy and can be customized to fit whatever color scheme or flowers you'd like! 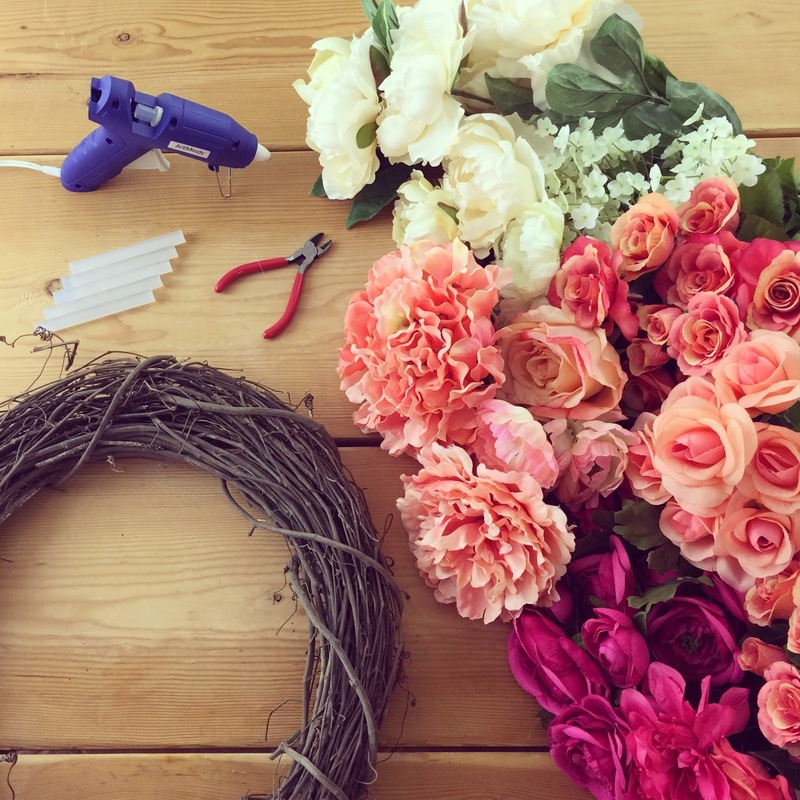 You only need a hot glue gun, wire cutters, fake flowers, and a grapevine wreath. I picked a variety of different types of flowers, but kept them all within a color scheme. 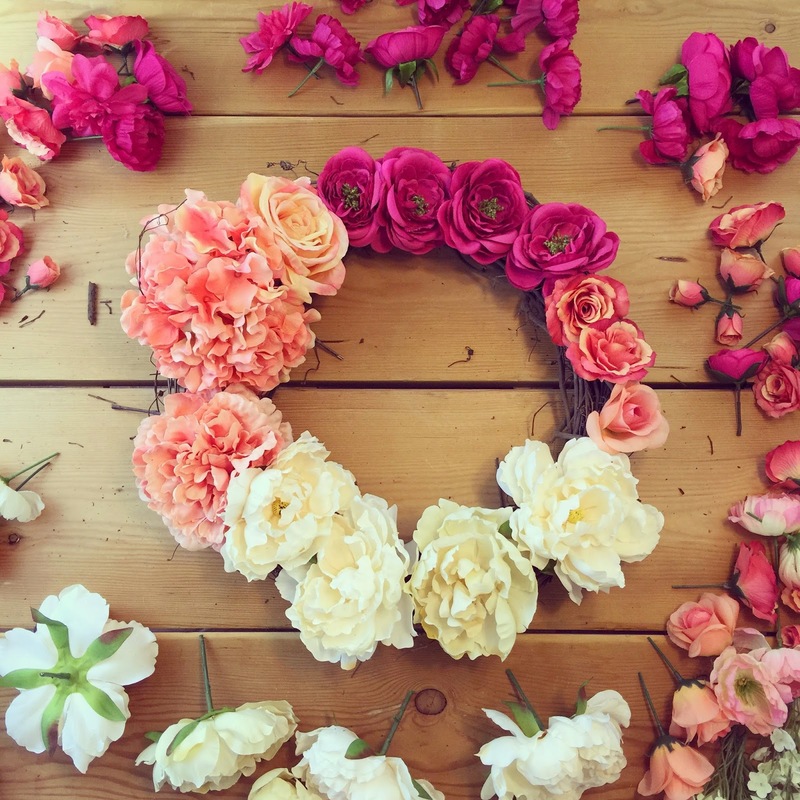 Make sure to buy the flowers on sale (otherwise they could get pricey!). I bought my flowers at Michael's, and they were on sale for 50% off, and then I used a 20% off total purchase coupon (which could be used on sale items)... so I scored big time! 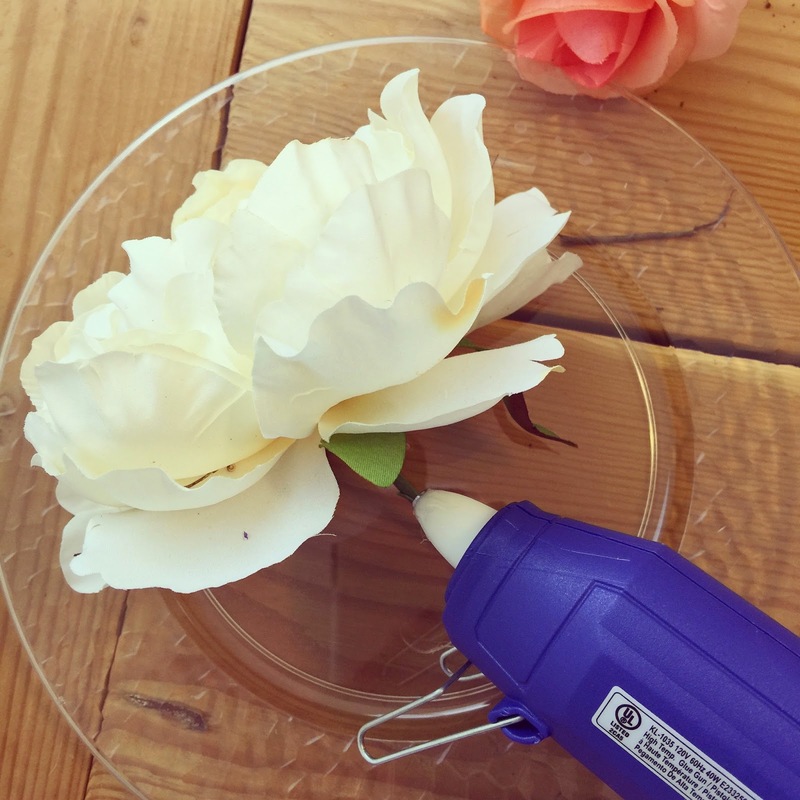 Begin by using your wire cutters and removing the flowers from the green stems (I cut about 2 inches from the head of the flower). 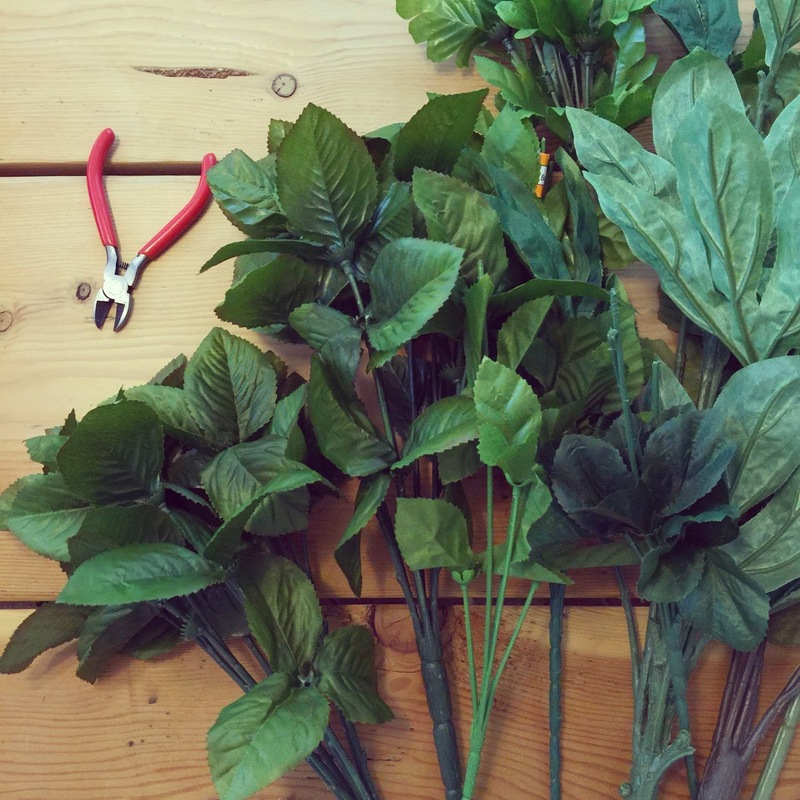 Save these greens to stick in the wreath once the flowers are fastened! To make sure you have enough flowers (and to make sure you display them as you'd like! ), lay them out around the wreath. This way, you can make adjustments before they are glued! 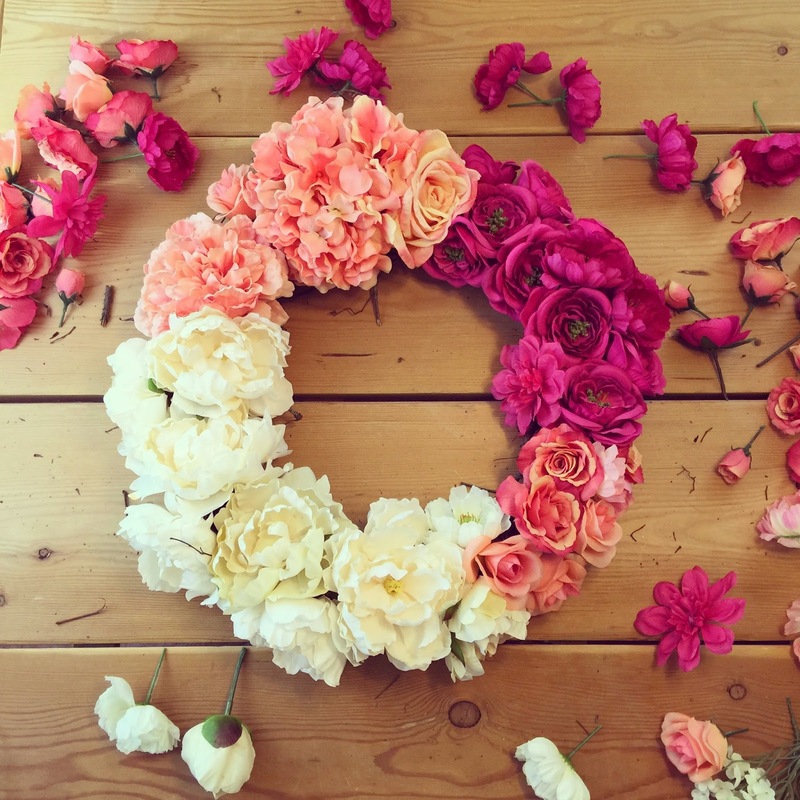 After you know how you want to lay out your flowers, spread them in a circle around the wreath. This way, you'll know where you planned to put them. 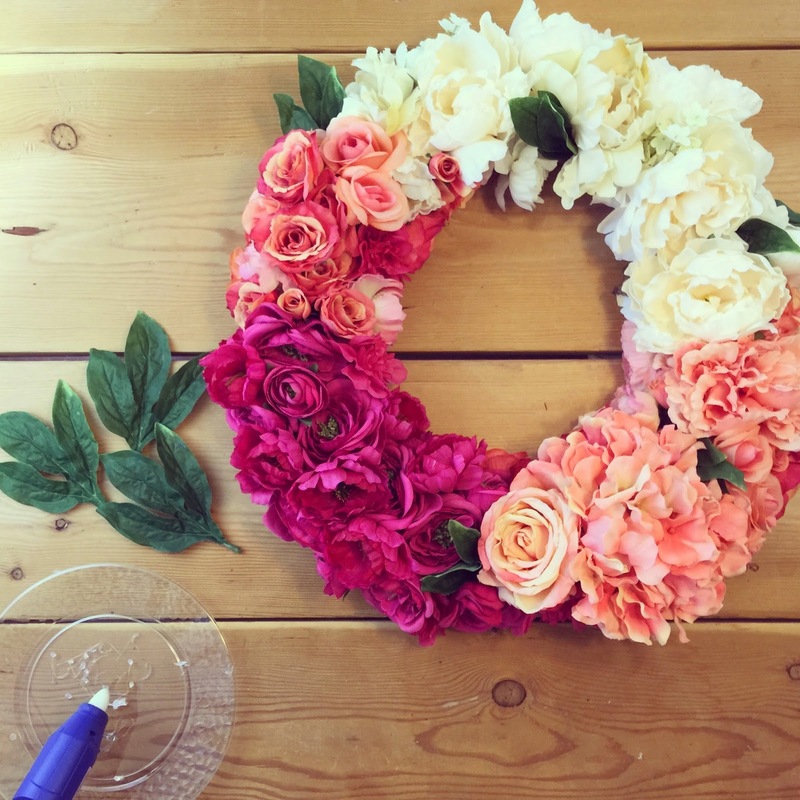 To fasten your flowers to the wreath, use your hot glue gun to put glue on the stems of the flower and then stick into the wreath. By the way, aren't glue guns amazing?! I just bought this recently for my DIY Jute Vase, and I love how you can basically glue anything - I seriously missed out not getting one of these sooner! 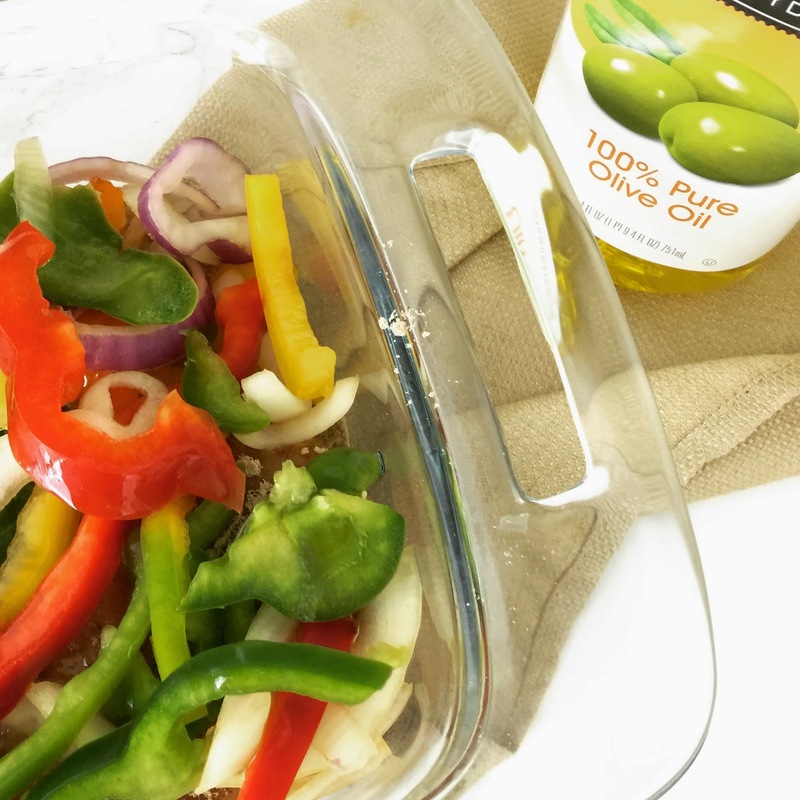 So easy, and super inexpensive! 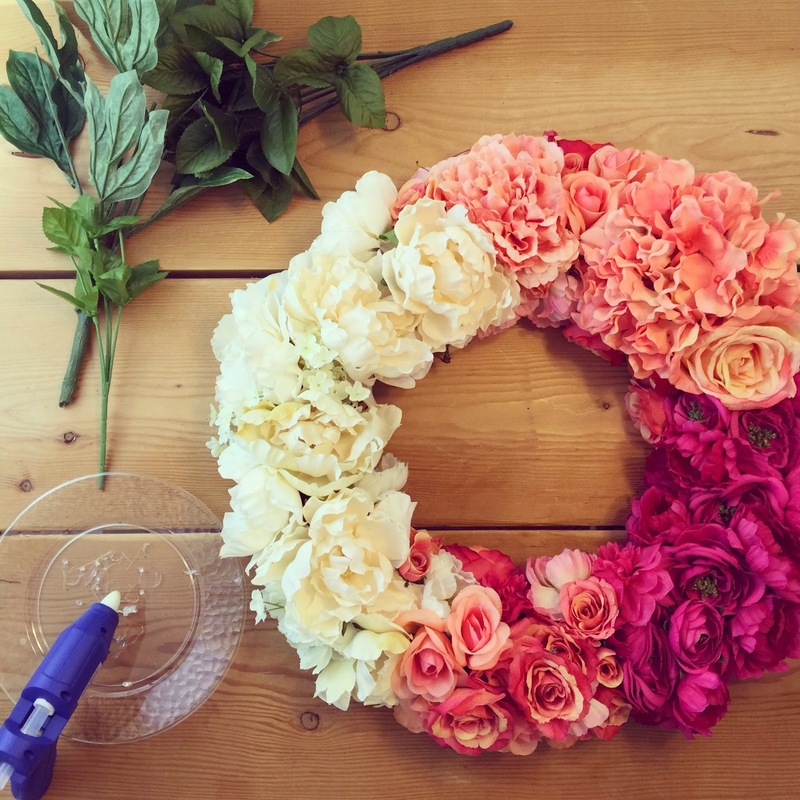 When gluing your flowers, start with the front of the wreath using the largest flowers. Since the front will be the most noticeable, spend most of your time here. The inner and outer sides won't be as noticeable! 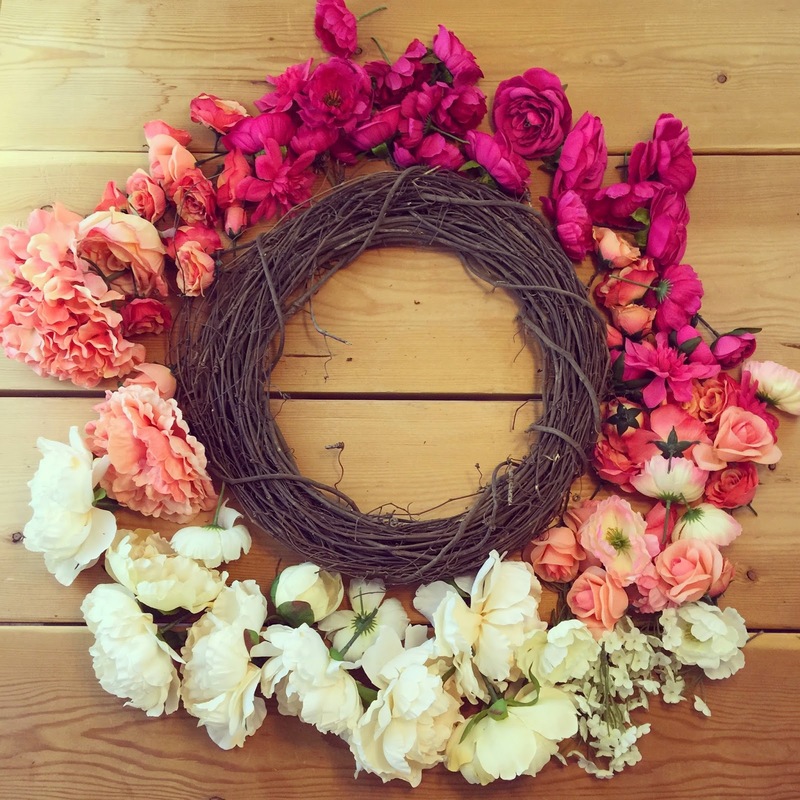 After the front of your wreath is covered, continue to glue flowers around the inner and outer sides of the wreath. 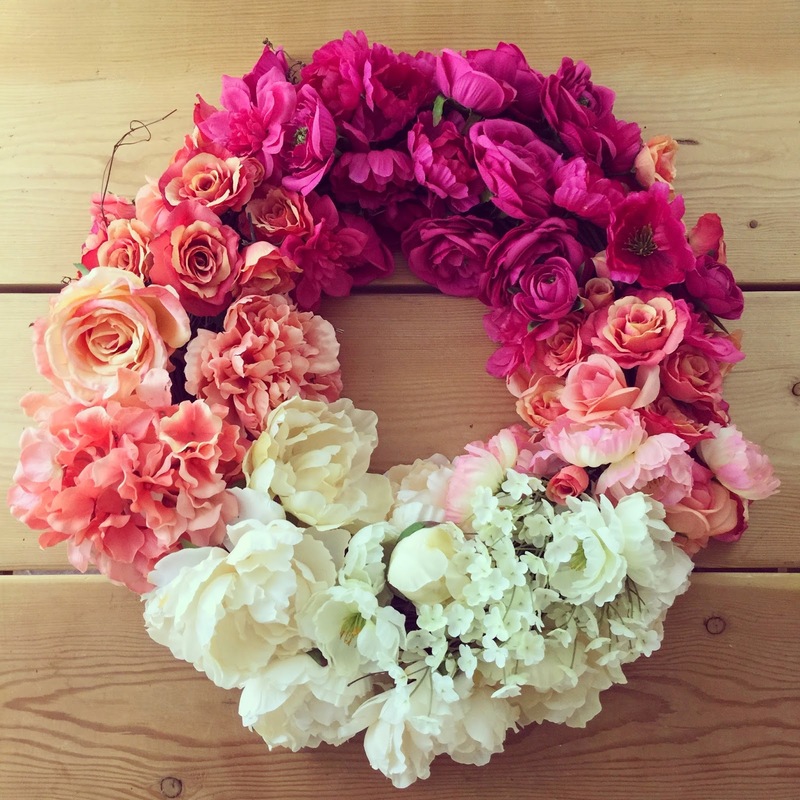 Save some of the smaller flowers for the end to fill in any holes. Once all of the flowers are fastened, pick your favorite greens and remove the leaves from the stems. Incorporate the leaves throughout the wreath. 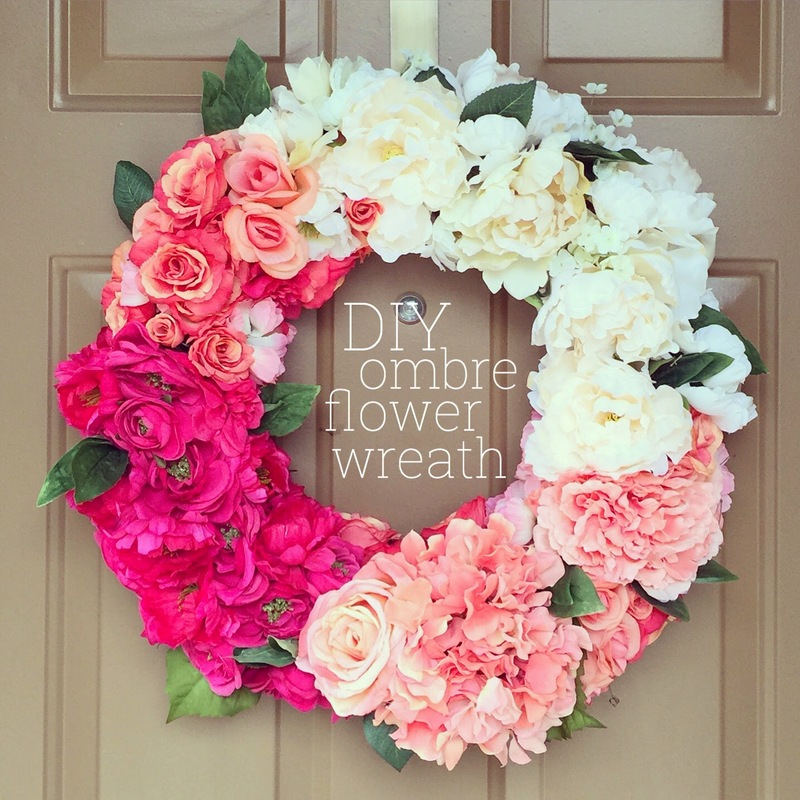 I thought the greenery added a "natural" element to the very flowery wreath. Add as many greens as you would like, and ta da! Your wreath is complete! All in all, this DIY took about 2 hours and cost about $35 to make. It wasn't super cheap, but since I plan on using it from spring into summer, I though it would be worth the investment! Keep in mind, if you buy hydrangeas, you will need fewer flowers since they are so large, but if you buy smaller flowers, like roses, you will need notably more. I did my best to mix both large and small flowers. 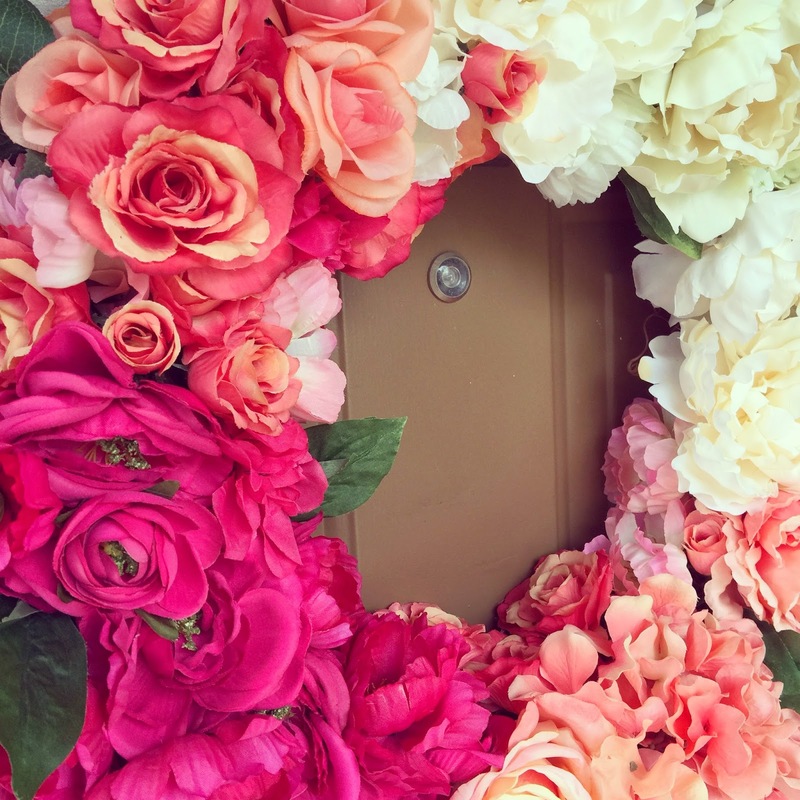 You can also buy fake flowers at various dollar stores. You may want to evaluate the quality, but if they look okay, then that is a very great way to keep the cost of this DIY down! I'm not going to lie, I love how it turned out - the bright colors and ombre effect are so fun and will be perfect for both spring and summer! Hang your wreath on a door hanger, or tie to the door with ribbon or burlap. Oh, fall, how I love thee. A girl can only eat so much chicken. I mean really, now that John and I are eating dinners at home, I think I've really over done it on the baked chicken. 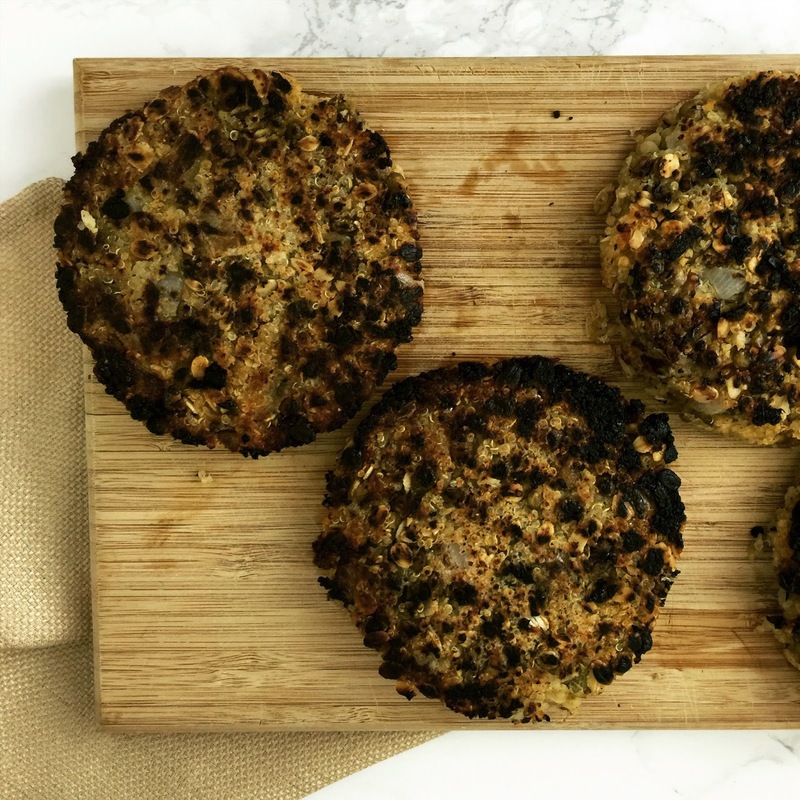 To switch things up, I started looking for a new dinner recipe (since I have about 4 recipes that I rotate every week...), and meat just didn't seem appetizing. 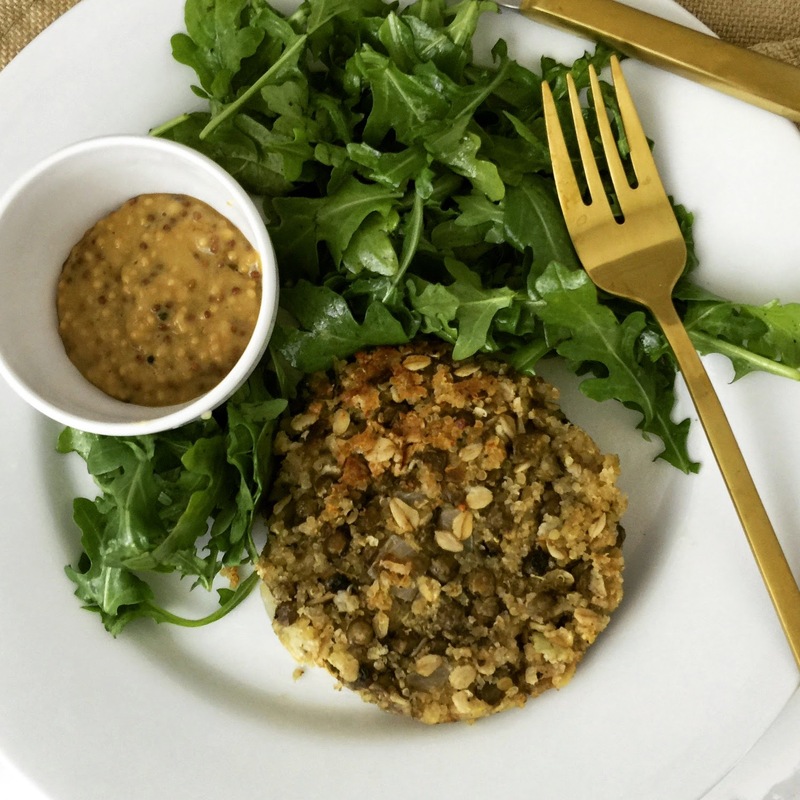 ...and then, I found these quinoa and lentil patties! 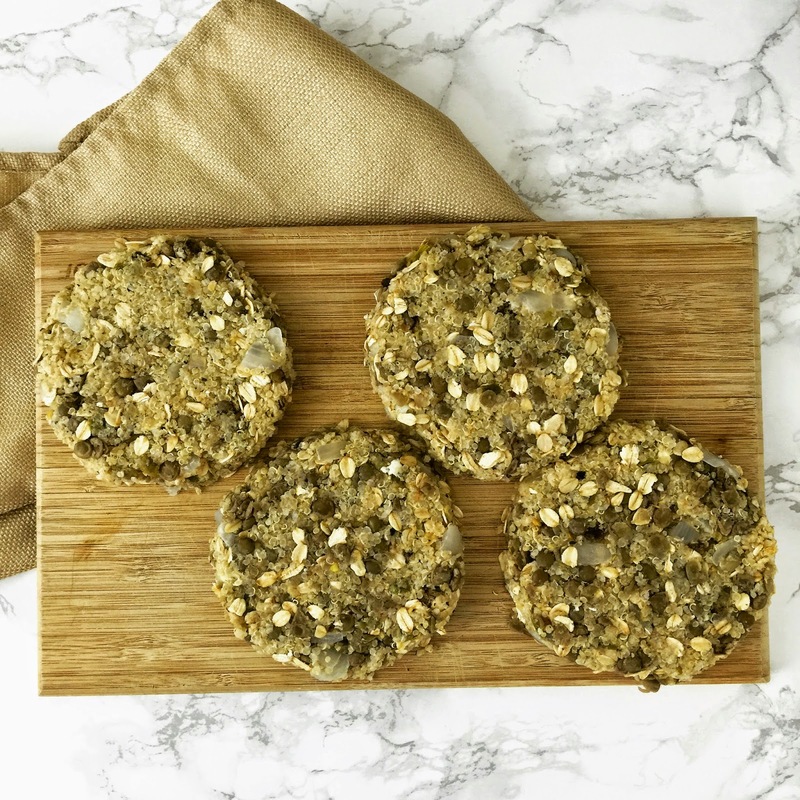 Mind you, these are actually called "quinoa and lentil burgers", but as soon as the word "burger" was put into play, John couldn't move past the fact that these weren't "real" burgers. So, in order to get him to eat it, I had to rename them to "patties" as to not appear as though I was attempting to simulate an actual burger patty (veggie burger). These bad boys have tons of flavor, and I was honestly shocked at how much I (and John!) enjoyed them! They aren't super pretty, but just give them a shot, and I promise you will be impressed! 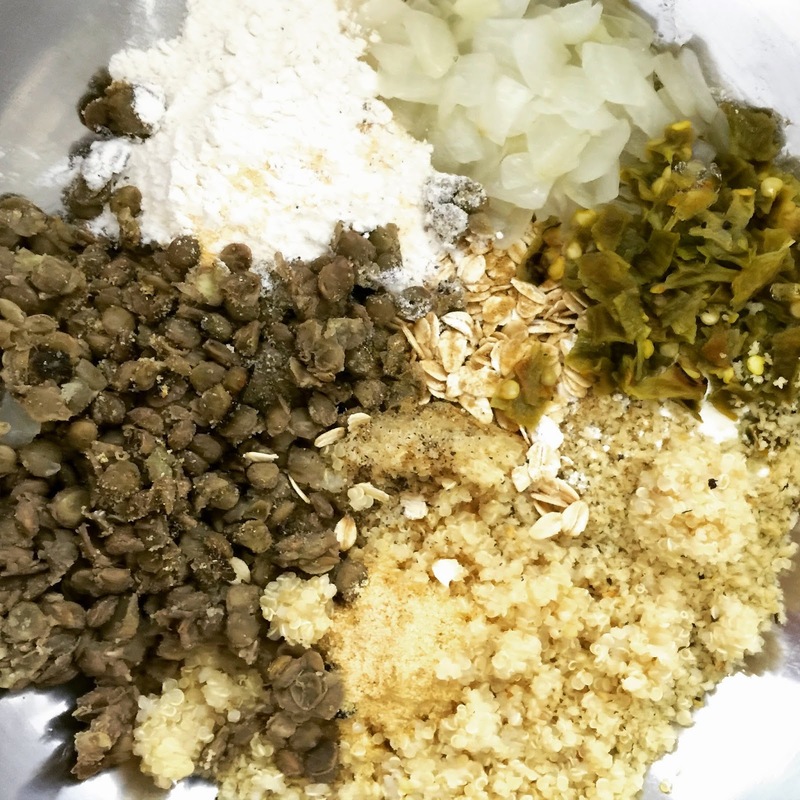 Simply combine the following ingredients in a bowl and mix! 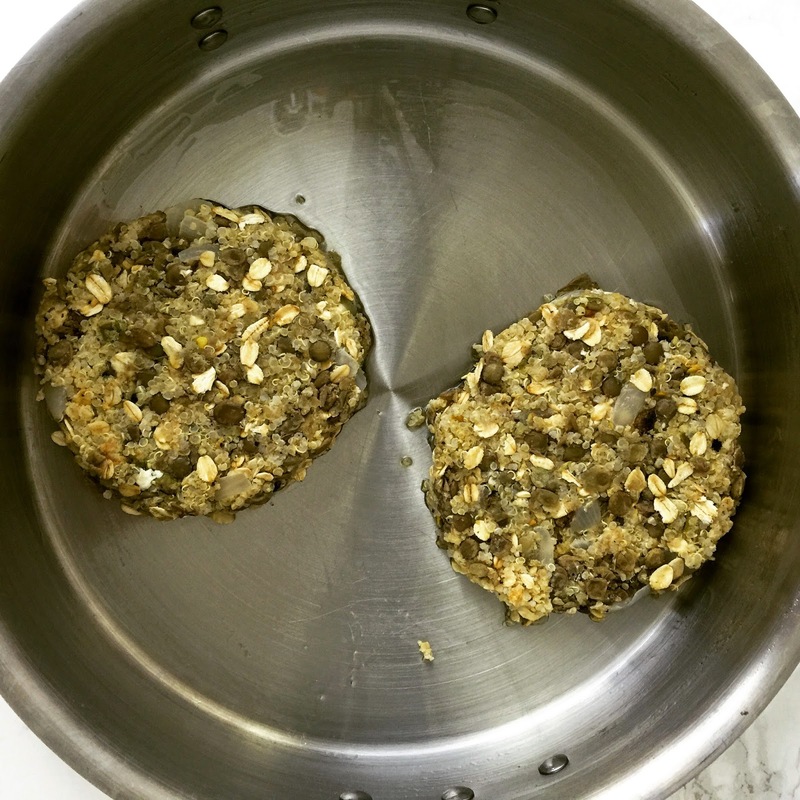 Using the mixture, form 4 equal size patties; make sure they are pressed together well so that they don't fall apart when cooking. They may seem a bit dry, but don't add any additional liquid - just go with it... they will be perfect! Heat 2 tablespoons of olive oil in a skillet, and cook each patty until brown on both sides (about 8 minutes total). Clearly, I didn't choose the best side to photograph... don't you hate that?!! And of course they are completely eaten before I realize that I should take a different photo. They look a little crispy, but let me tell you, they were quite tasty! 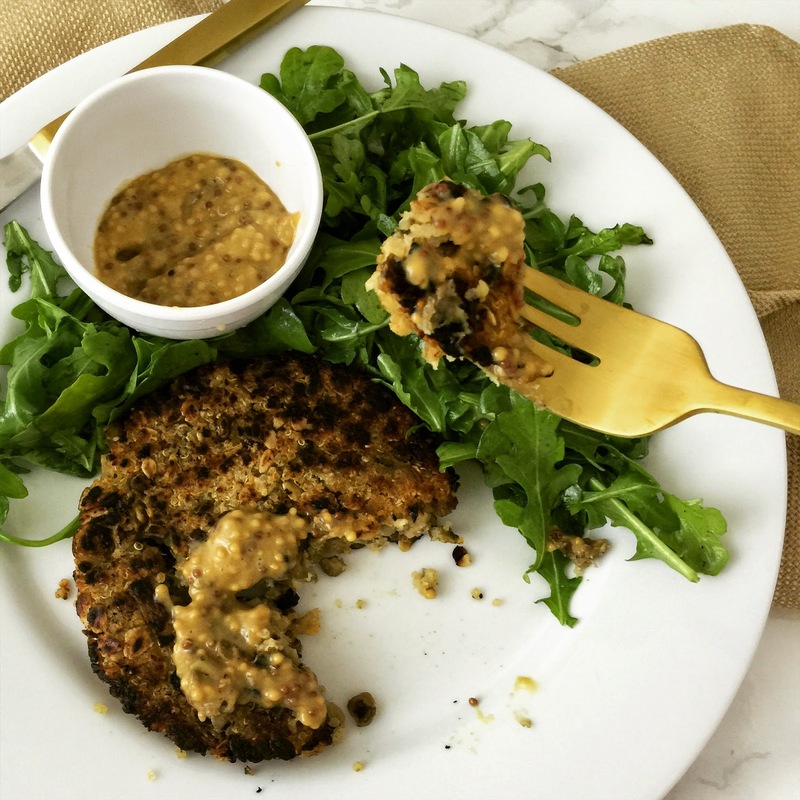 Serve the burgers with a honey dijon mustard. Combine 2 tbs of dijon mustard with 3 tsp of honey. It is so tasty... like, "spread this on everything I can think of" kind of tasty! 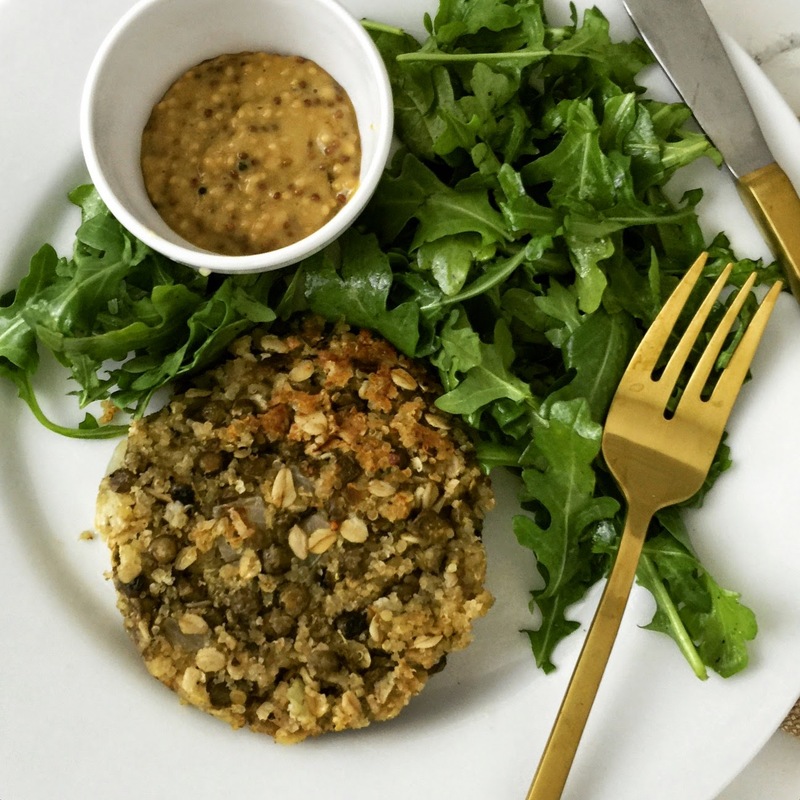 Serve on a burger bun, or if you're like me, with a bed of greens! 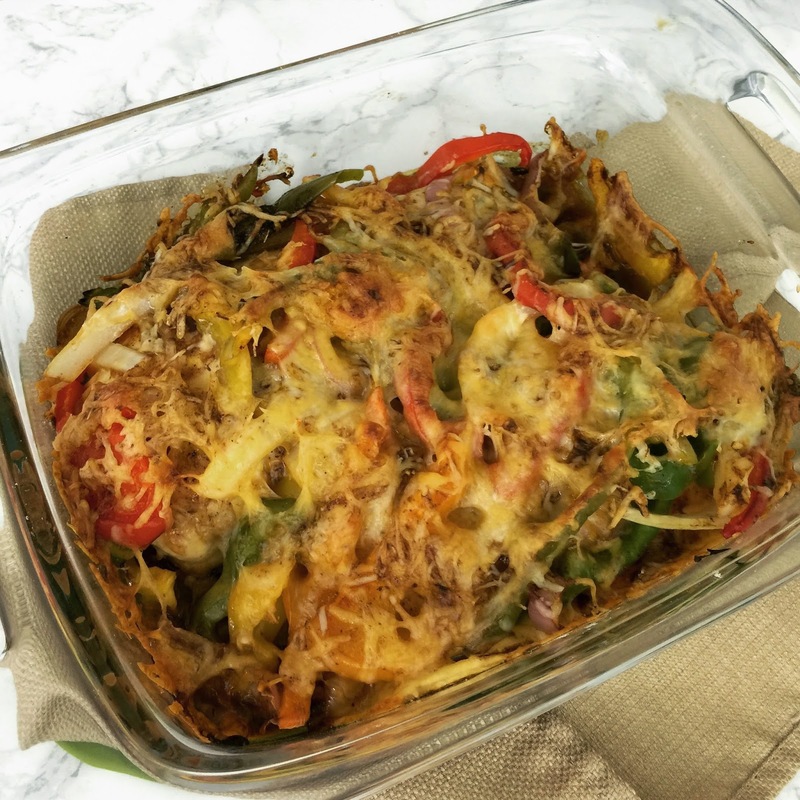 This recipe is such a great switch-up from our normal meals. but they are a great compromise for when we are craving something a little different! The weekend that Lilly took over the world! Sunday morning I was flying back to Arizona after a quick trip in Washington, DC and fully missed the Lilly madness... and thank God that I did - wowza!! Talk about craziness! Honestly, I would have loved to have scored a few of the shift dresses, but after hearing about all of the in-store craziness, I just feel like the odds of actually getting a shift dress were terrible! 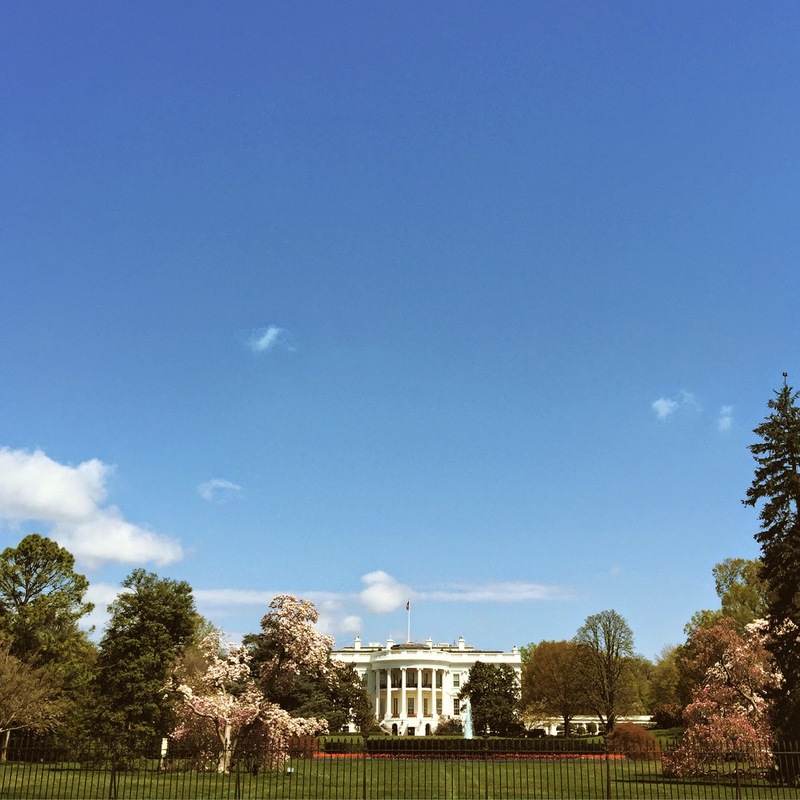 John and I spent the weekend in DC, and it was my first time seeing the city in the spring - and it was beautiful! Here are a few photos from our whirlwind two days. Tulips everywhere - makin' my flower lovin' heart happy. Last week was the Cherry Blossom Festival, and a few of the blooms were still hanging around. 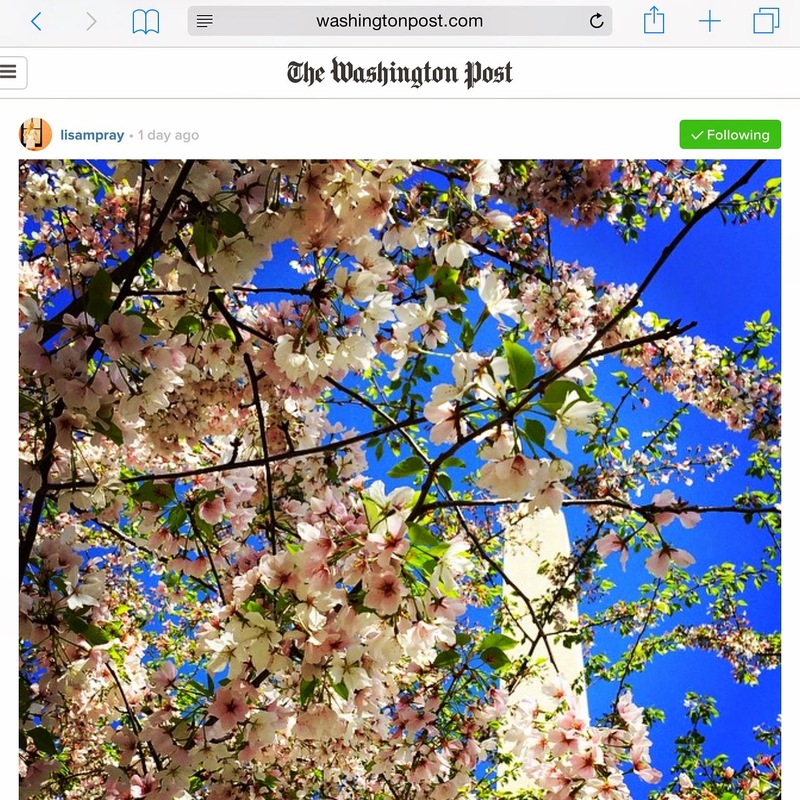 I posted the below photo of the Washington Monument through cherry blossoms, and The Washington Post shared it on their website! 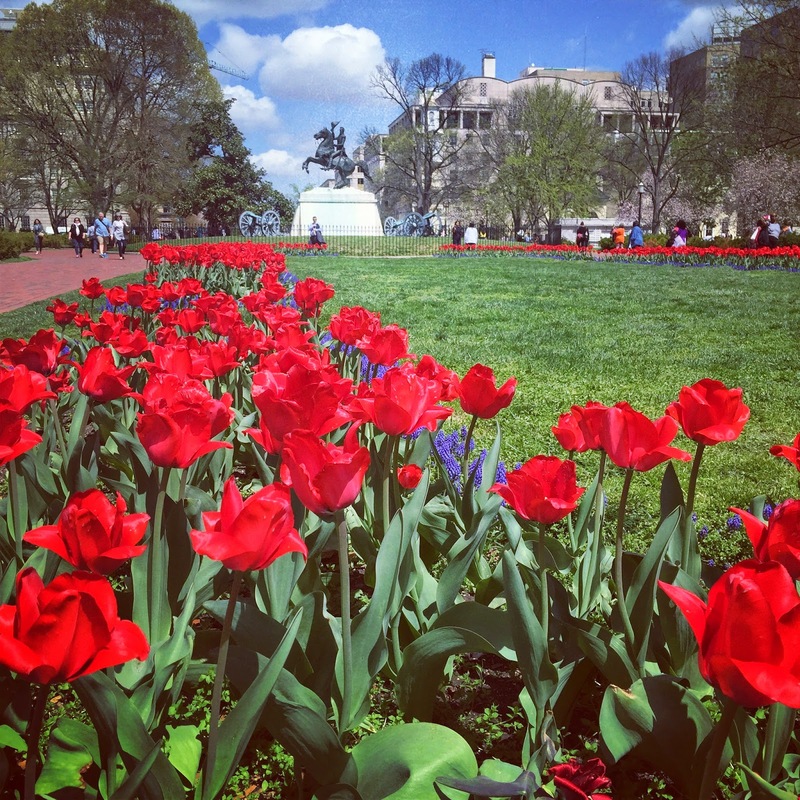 DC in the spring may just be my favorite time there! 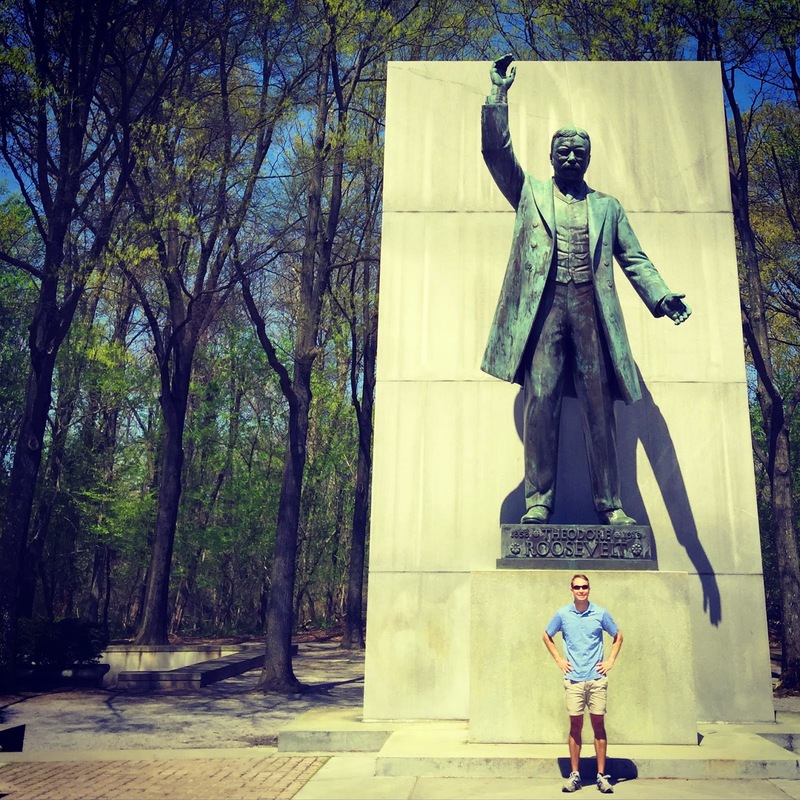 We rented a tandem kayak and kayaked on the Potomac around Theodore Roosevelt Island! 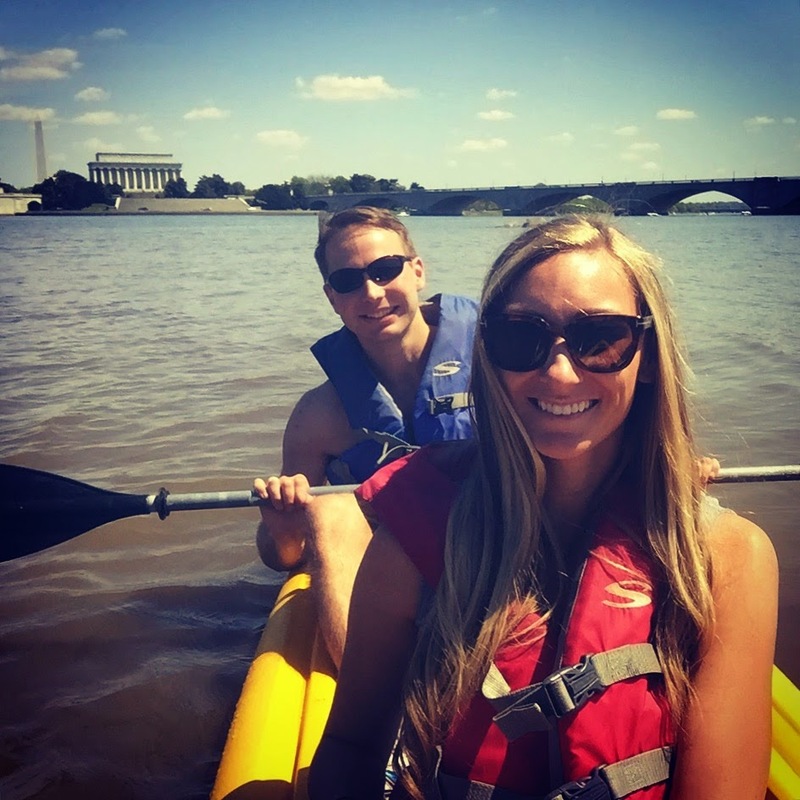 It was both of our first time, and it was so fun seeing some of the monuments from the river - and let's be real... John did the majority (read: all) the hard work, ha! I’ve previously mentioned that a few months ago John and I decided to cancel our cable. We were spending almost $200/month (including internet), and a good portion of the services that we were paying for (On Demand, for example) never even worked! And that's just way too much money to pay for something we don't even care about. The worst part? They are the only cable provider option where we live! So, we decided that it was time to save some cash and cut the cord. Although we aren’t paying for cable, we have found many ways to keep up with our favorite shows without missing a beat. Here are some of the cost effective workarounds that we have found. iTunes has a been a great way to watch our favorite TV shows (and holler, for no commercials!). Although you have to pay for each episode ($1.99-$2.99), most shows do not air more than once a week, which accumulates to a monthly total of about $12/month. We also started a HuluPlus account, which is pretty similar to Netflix; it airs shows a few days (some the day) after they air on television. HuluPlus is only $7.99/month, and this is the way that I watch the majority of my currently-airing TV shows. 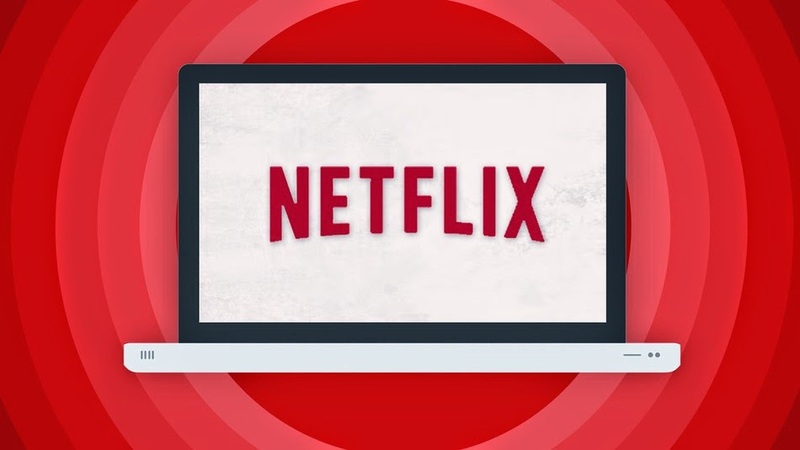 John and I were subscribers to Netflix ($10.99/month) even before we cancelled our cable, but now that we have cut the cord we are using it more and more. There are also shows that are specific to Netflix only (House of Cards, for example). A lot of TV stations have episodes that can be streamed for free (others require you to log in with your cable provider; so, if you cut the cord, this won’t be an option – unless you have a neighbor who has cable and doesn’t mind divulging their log-on information!). If a TV station doesn’t allow you to stream, they often allow you to pay a small monthly fee to subscribe to the station. For example, John and I enjoy watching Survivor (quality television, I know), which airs on CBS. 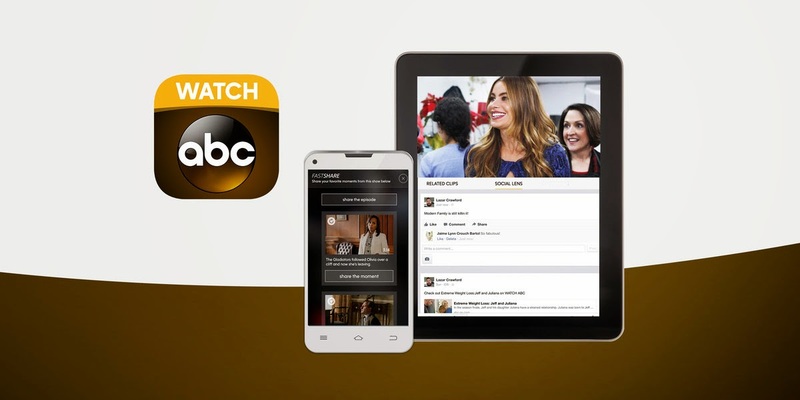 We signed up for CBS All Access ($4.99/month) which allows us to watch all television shows and depending on your location, you can also stream them live. And for all those Game of Thrones Lovers: fear not! 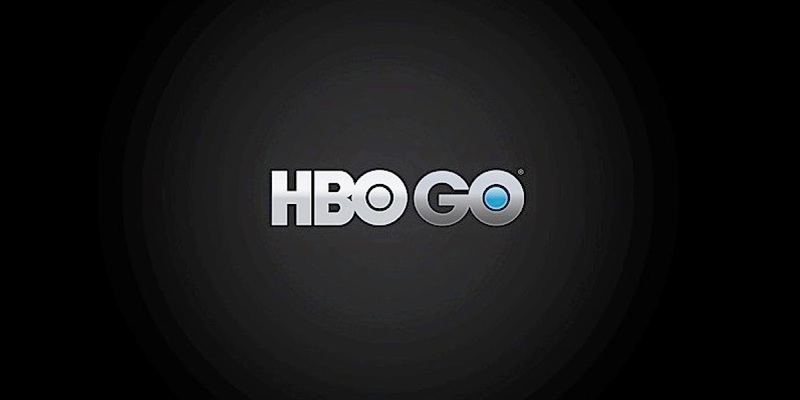 HBO GO also offers subscriptions for $10.99/month... with the first month free (I believe you need Apple TV to stream it though)! You better believe this was non-negotiable for John! 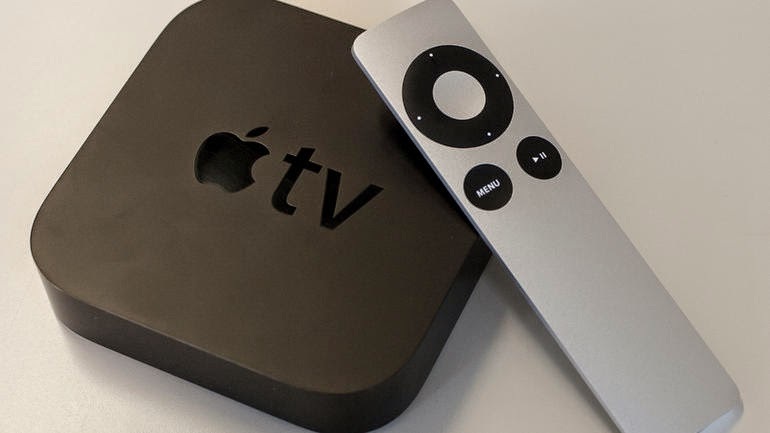 Apple TV (a one-time purchase cost of $65 - just marked down from $99) is great because it allows you to stream your HuluPlus, iTunes, Netflix, etc. directly to your TV. There are also a number of live TV options that are available (live news from a number of networks such as CBS, CNN, Fox, ABC, etc.). Apple TV also allows you to stream shows from your phone, computer, or iPad onto your TV. Before John and I bought Apple TV, we would connect an HDMI cord (about $15) from his computer to the TV. This way, we were able to stream what was on his computer onto the large television. Not surprisingly, this was really cramping my blogging style since I insist on using his computer when I blog (which is why we moved to Apple TV – priorities, y’all). Now, this may seem super medieval to some people, but this is actually how I watched the Bachelor all season long before we figured out how to navigate alternative TV providers. One of my TVs has a built in antenna that provides all basic television station (CBS, ABC, NBC, PBS, etc., and a bunch of stations in Spanish). It's completely free, and a great option if you are able to make the time to watch your show when it actually airs. You can also buy antennas for relatively cheap from Best Buy (about $30)... let me tell you, they have come a very long way – so don’t worry about it junking up your TV area! 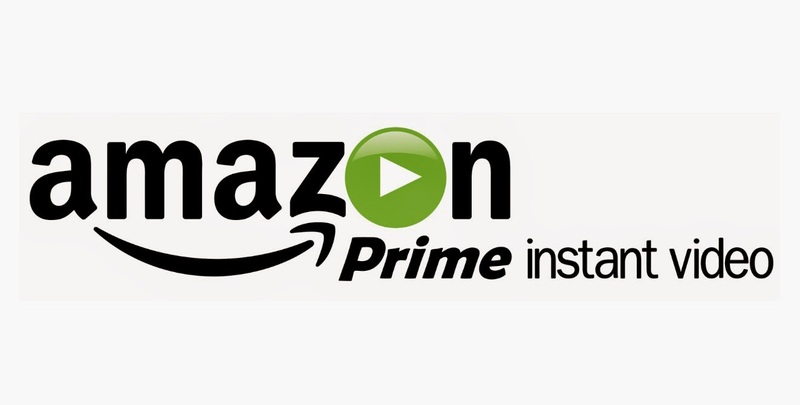 Already have Amazon Prime? Guess What! You also have Amazon Instant Video! John and I have never been big TV watchers (or, at least the kind that need to watch shows the moment they air), so if you are super into being the first to watch things, then these may not be your best options. I honestly can’t imagine us getting cable again – there are just way too many workarounds, and I think we would be hard pressed to find a show that isn’t available through some sort of alternative method. What are your tips for TV without cable?! 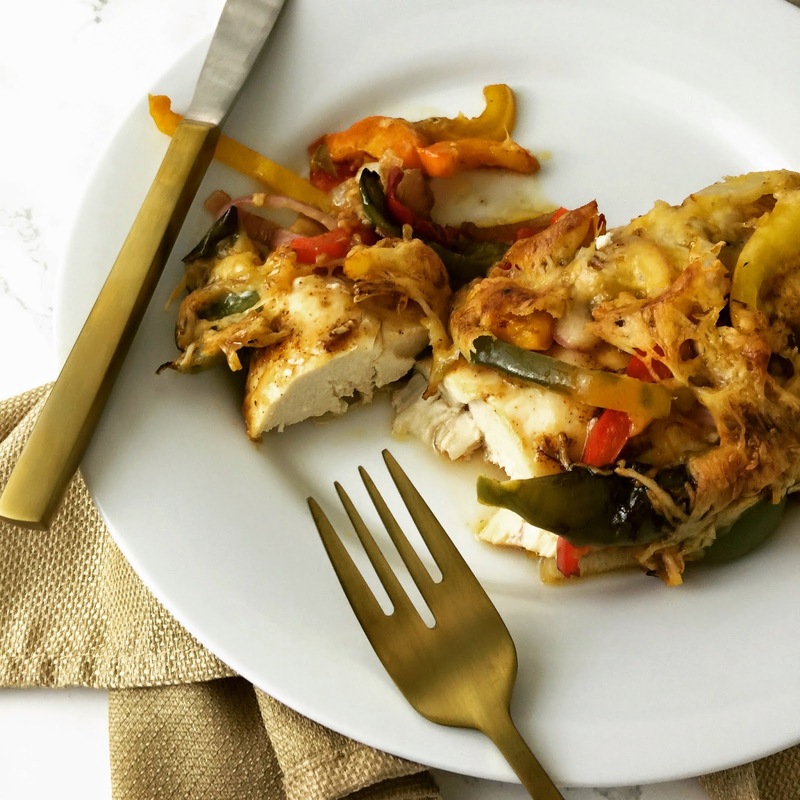 Dinner for two: Chicken Fajita Bake! Dare I say we are getting into a rhythm?! Don't get me wrong, we aren't eating four course meals... but one course (or two, if you count our apres dinner Ben & Jerry's... mmm, half baked!!) is good enough for us beginners! 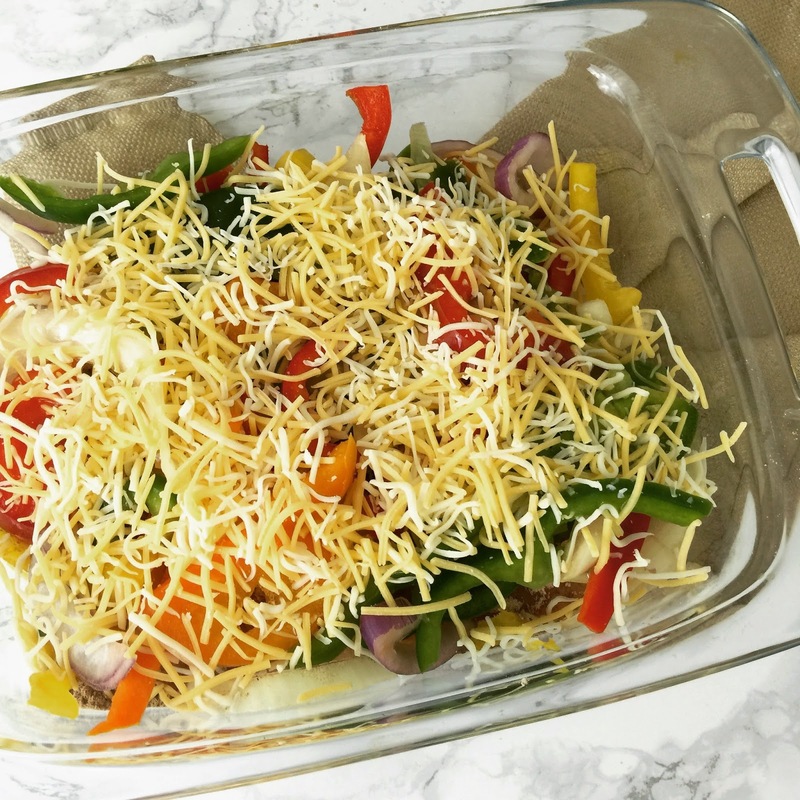 This chicken fajita bake is so simple and wonderfully tasty - it will be a definite go-to in the future! 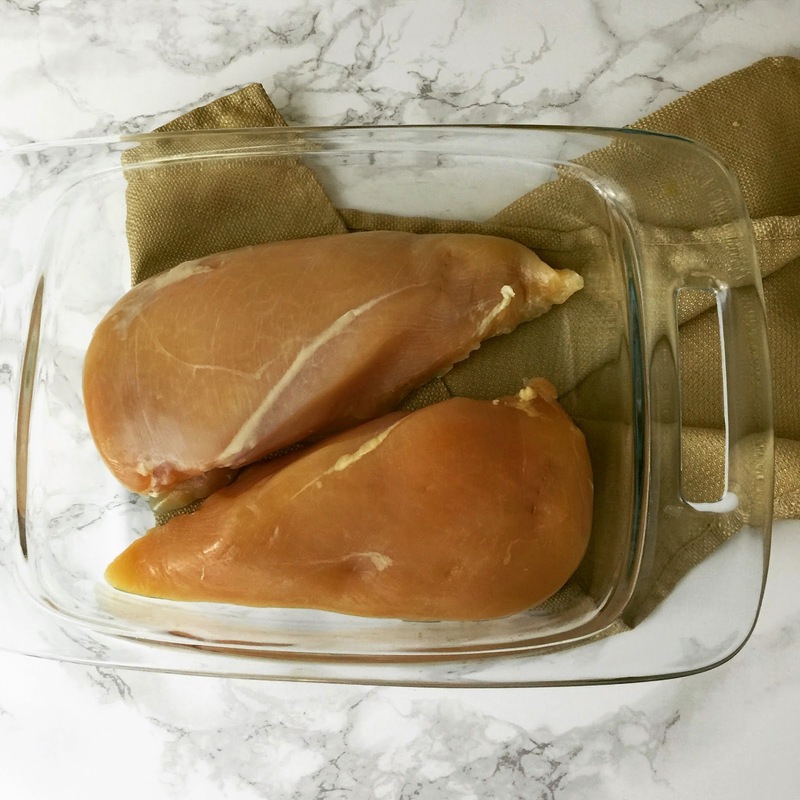 Begin by placing two chicken breasts in a baking dish with a non-stick spray. 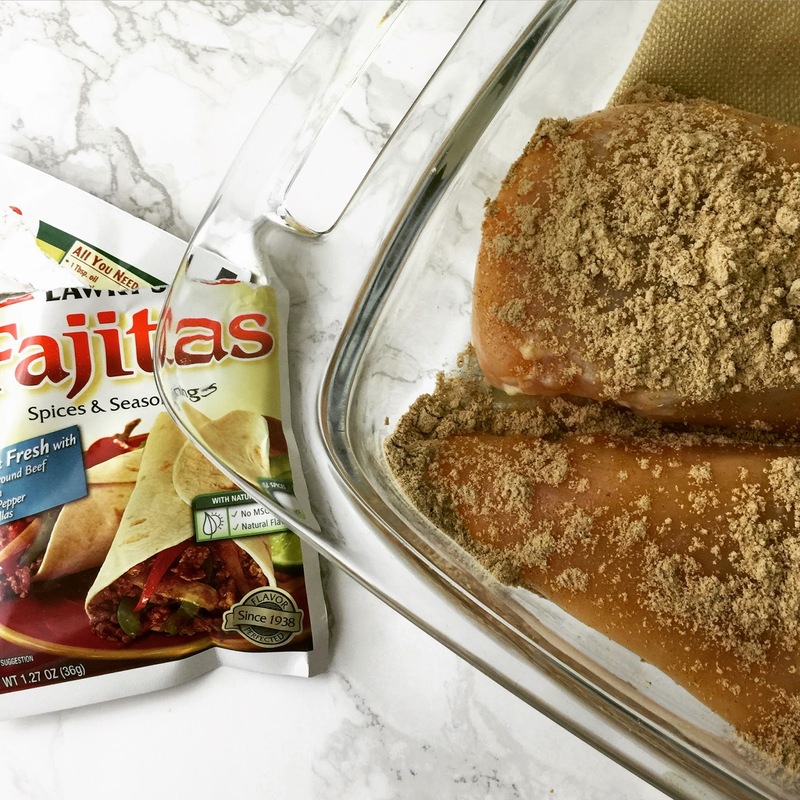 Sprinkle taco/fajita seasoning on top of the chicken breasts. 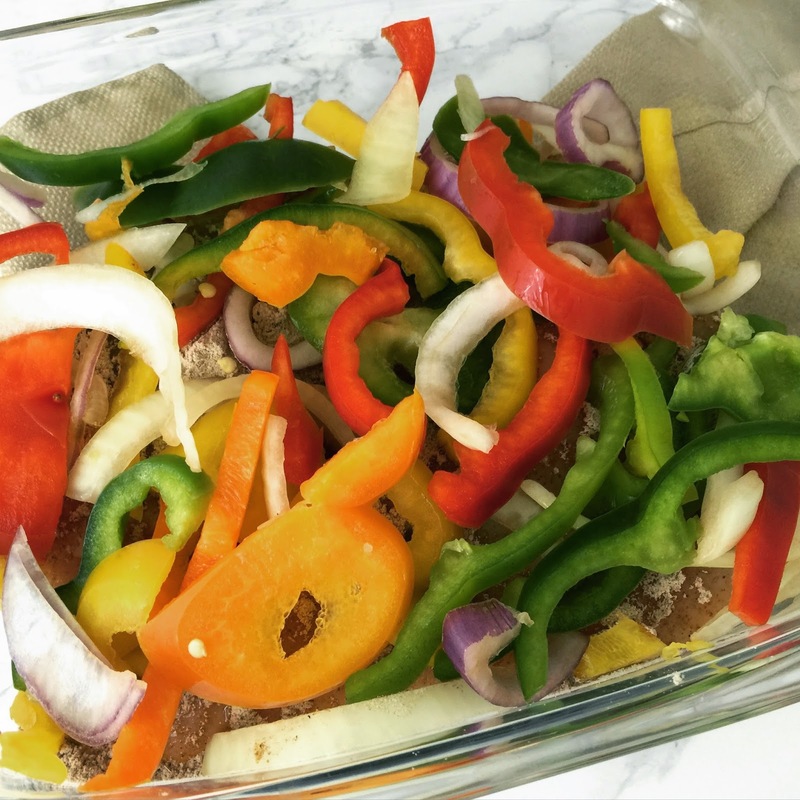 Top with peppers... and lots of 'em!! And now for the best part... top with shredded cheese! Bake for 45 minutes at 375 degrees, or until the chicken is cooked through. And don't freak out... it may look a little crispy, but it is just the cheese mixed with the taco seasoning (can you tell that I had to convince John that it wasn't burned...?). After baking, let the chicken rest for 5 minutes. 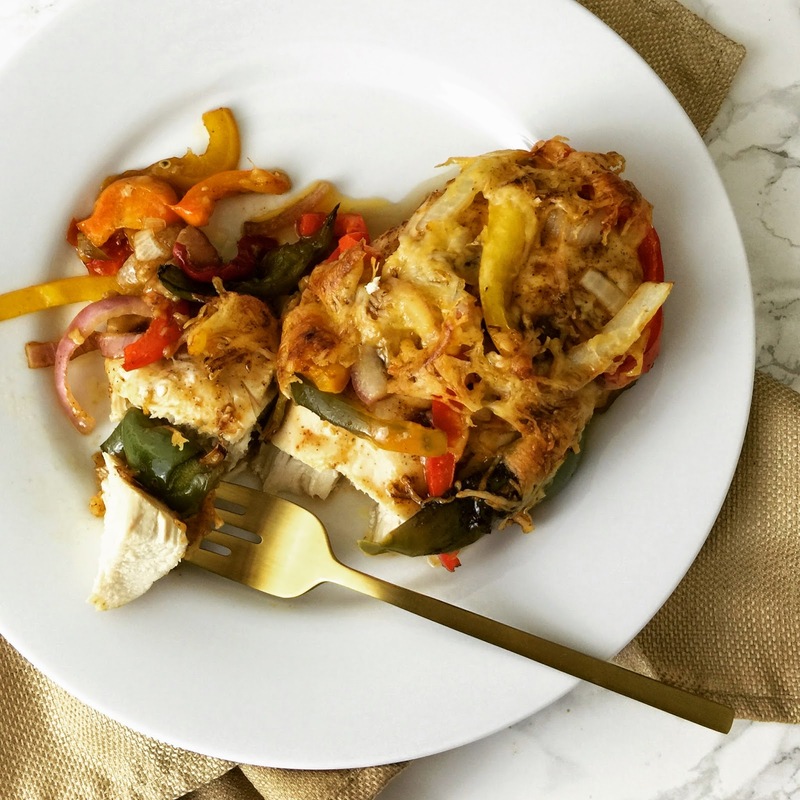 Serve with rice and any other fajita toppings that you enjoy! 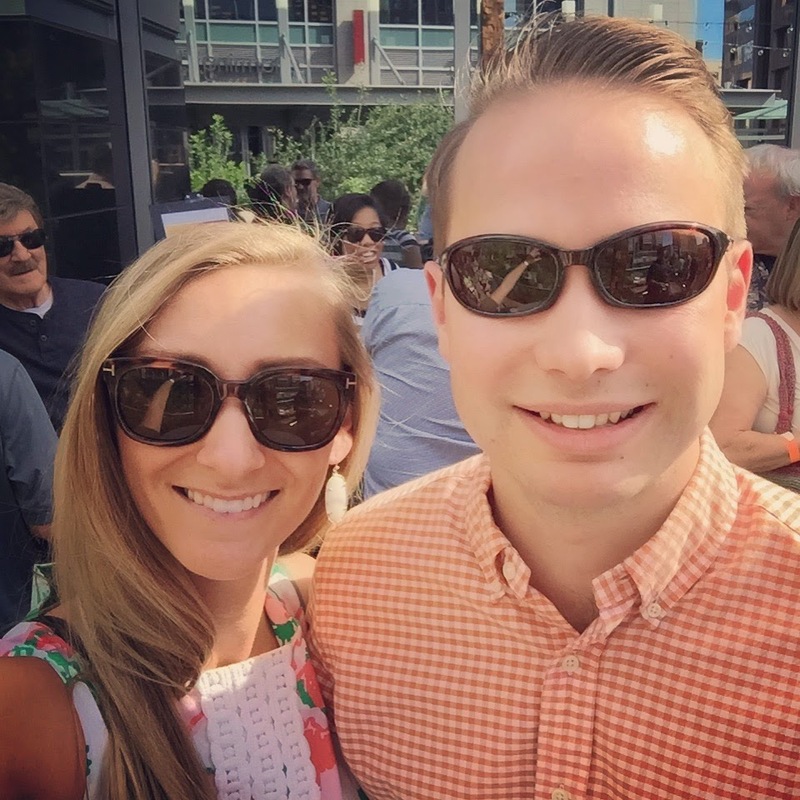 This weekend John and I participated in the Phoenix Symphony Young Professionals Downtown Stroll. Our good friends are on the planning committee for the organization and invited John and me to join them - and it was such great fun! 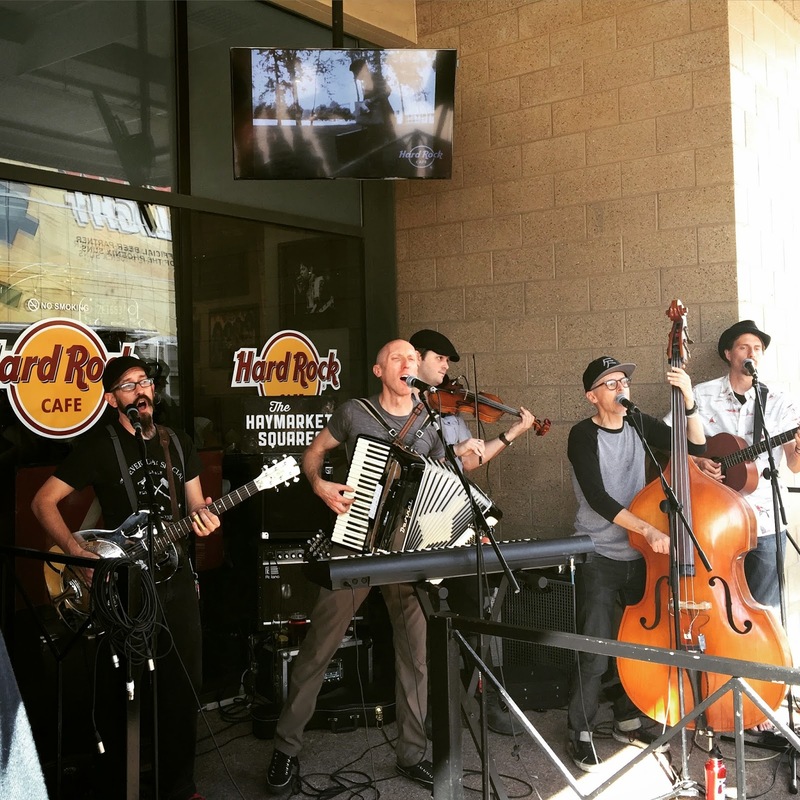 There were 9 participating restaurants with food, drinks and a live band at each location. The weather was lovely (the high was only 82!) and it was really cool to be able to try out several different restaurants that we may not have normally tried. 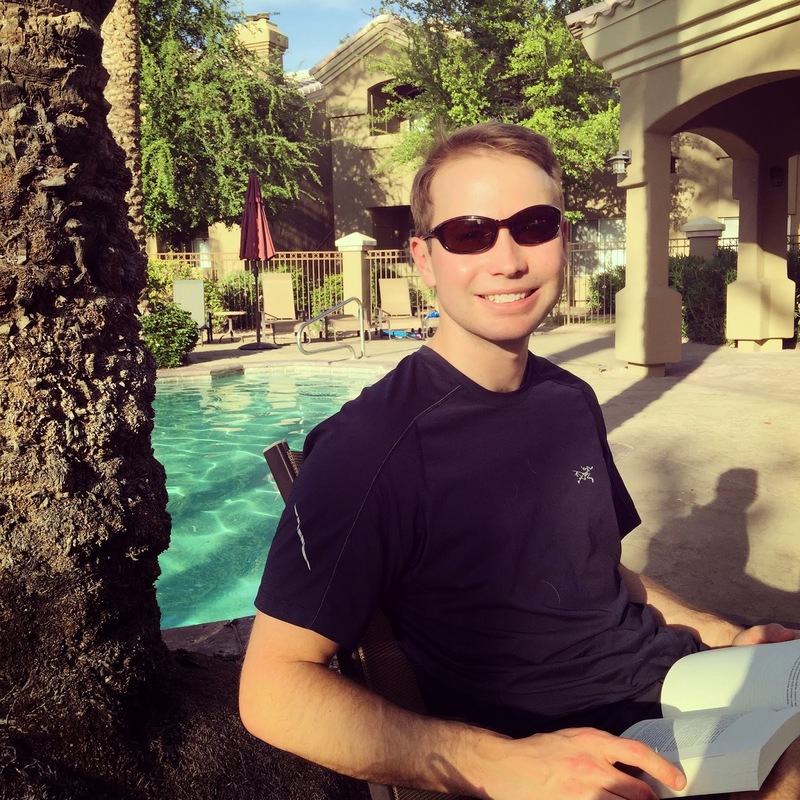 John works in downtown Phoenix, so he is pretty familiar with the area, but I never really get a chance to get down there and I enjoyed having a reason to spend a bit of time exploring. I was quite impressed with the turn out - about 600 tickets were sold! The live music was everything from classical to bluegrass. 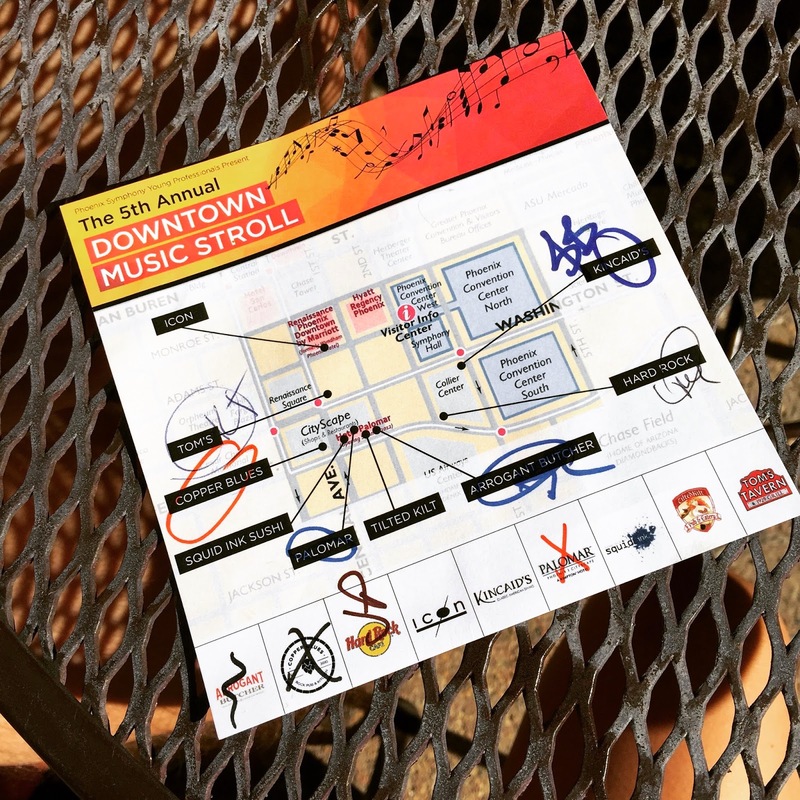 And as long as you went to 5 of the 9 locations, you received a voucher for the Phoenix Symphony. I've been spinning 3-4 times/week for the last couple months, and I finally treated myself to my first pair of clip-ins! Hollaaa for our REI dividends! 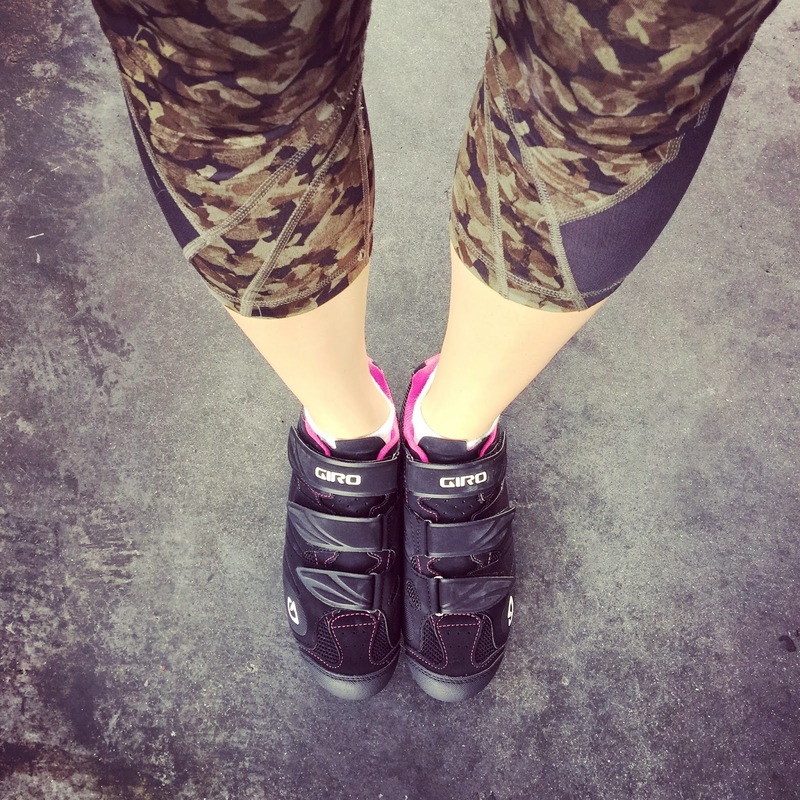 Spinning is such a great and efficient workout - highly recommend to someone who has never tried! 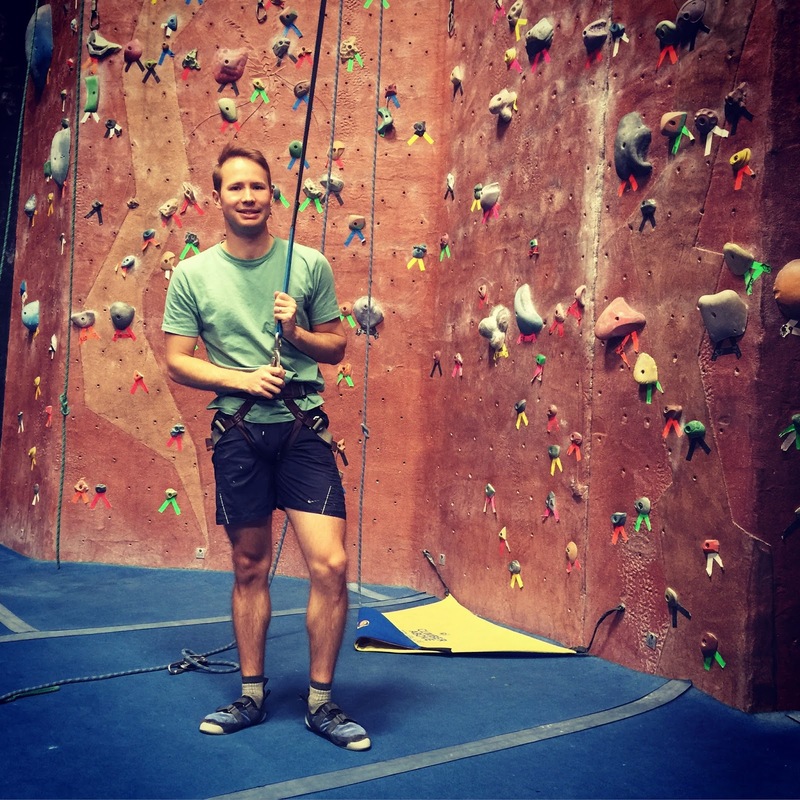 And while I've been busy spinning, John joined a climbing gym. It's great because although John has been to a few spin classes with me, it really isn't his thing (shocking, I know), so he is able to exercise doing something he enjoys when I'm out doing something that I really enjoy! 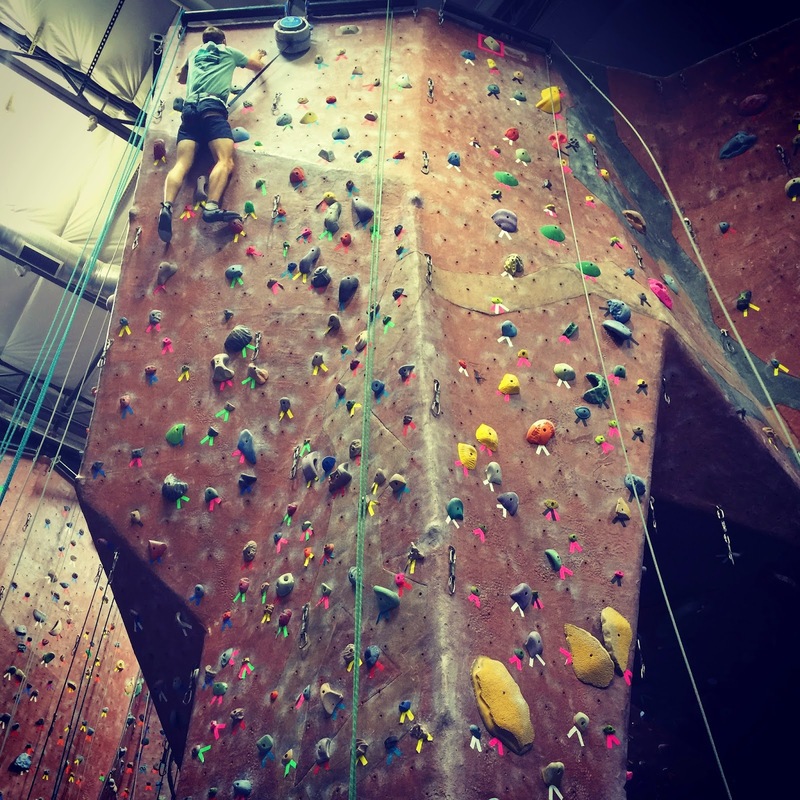 I've been to climbing gyms before, and every time I am severely put to shame by little 3rd graders who can climb like legit monkeys... I swear, they are absolutely fearless and just dangle around weightlessly! 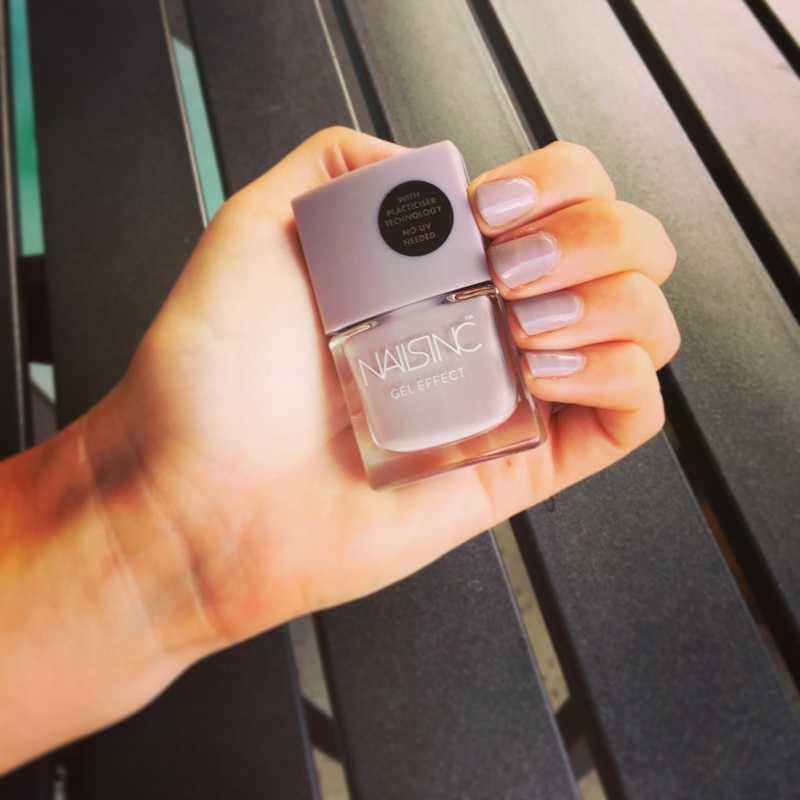 If you ask me, there is nothing better than an at home manicure that doesn't end in smudges - and this weekend, I was able to sit still long enough to accomplish that... bam!! 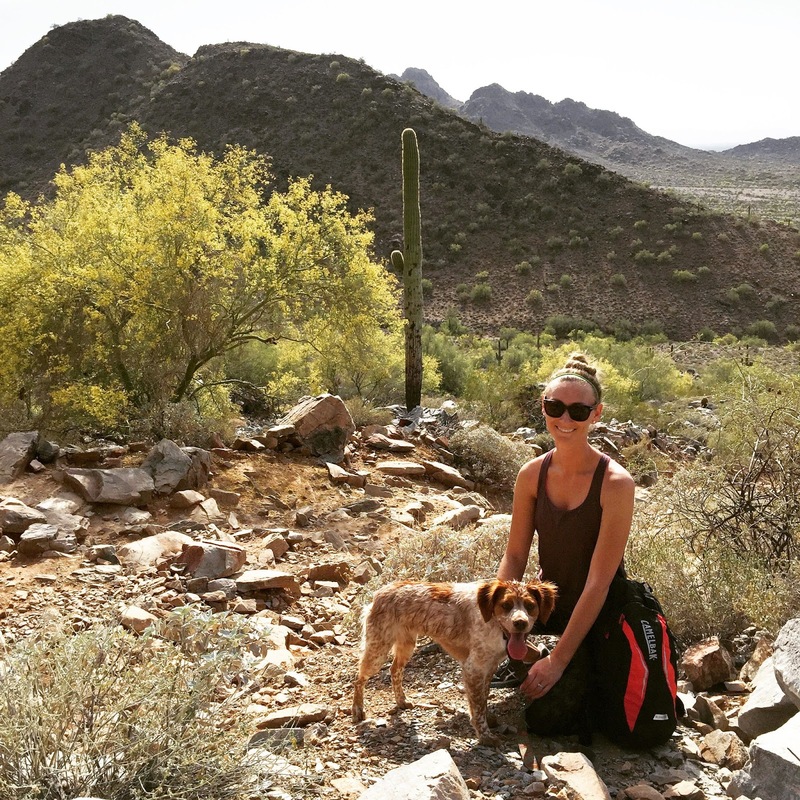 Sunday afternoon, John and I took a mini hike in the Phoenix Mountains Preserve. We had only been there one other time, and it's pretty great! There isn't much shade, so a nice breeze is completely necessary, but only being 5 minutes from our house, it's pretty tough to pass up the convenience! And along with all of the great weather comes grilling and patio dwelling... I am certainly not complaining - we are soaking up all that we can before it gets too hot!